Described are compositions and methods for the enzymatic abrading and color modification of dyed textiles. The compositions and methods permit a textile manufacturer to obtain a wide variety of different textile finishes and colors using exclusively enzymatic methods. 本申请要求2009年8月27日提交的美国临时专利申请系列号61/237，534和2009年8月28日提交的美国临时专利申请系列号61/238，029的优先权，所述文献在此通过引用的方式完整并入作为参考。 Priority to US Provisional Patent Application Serial No. 61 US Provisional Patent Application Serial No. 61  This application claims the August 27, 2009 submitted / 237,534 and 28 August 2009 filed / 238,029, and the said document herein by reference in its entirety incorporated by reference. 本发明的组合物和方法涉及组合的酶促纺织品磨蚀和颜色调节。  The compositions and methods of the present invention relates to a combination of enzymatic textile abrasion and color adjustment. 所述组合物和方法部分地基于以下发现：某些酶可以依次地有时用于相同的处理浴液（treatment bath)中以仅使用有限的成套酶系统产生具有广泛类型修整（finish)和颜色的纺织品。 The compositions and methods are based in part on the discovery that: certain enzymes can be sequentially used in the same treatment bath is sometimes (treatment bath) to use only a limited sets of enzymes having a wide system generates the type of dressing (Finish) and color textile. 现在充分建立了使用酶加工纺织品。  is now well established use enzymatic processing of textiles. 淀粉酶用于退浆，纤维素酶用于磨蚀和磨光（abrading and abrading),并且过氧化氢酶用于漂白清洁。 For desizing amylase, cellulase for abrasion and polishing (abrading and abrading), and catalase used for bleaching cleaning. 最近，酶如过水解酶(perhydrolase)和漆酶已经应用于纺织加工,其中使用此类酶替代苛刻的化学漂白处理。 Recently, as perhydrolase enzyme (perhydrolase) and laccase textile processing it has been applied, wherein such enzymes replace harsh chemical bleaching treatment. 虽然酶促纺织品处理法已经大大降低了纺织加工对环境的影响并且为纺织品生产者产生显著的成本节约，但是纺织产品的完整制造继续要求多个经常涉及独立浴液的分开的步骤和多个淋洗循环以在启动后续工艺之前除去来自某一个工艺的反应组分。  Although the enzymatic textile treatment method has been greatly reduced impact on the environment and textile processing to produce significant cost savings for the textile producers, but complete manufacture of textile products have continued to require a separate step often involves a plurality of separate bath and a plurality of rinse cycles to remove certain components from the reaction process before starting a subsequent process. 此外，酶促纺织加工迄今不能够产生现代纺织品消费者所要求的一系列修整和颜色，从而限制其接受性。 In addition, enzymatic textile processing so far can not produce a range of modern textile finishing and color desired by consumers, thereby limiting its acceptance. 描述了涉及组合的酶促纺织品磨蚀和颜色调节的组合物和方法。  The compositions and methods described relates to a combination of enzymatic and abrasion textile color adjustment. 在一个方面，提供了用于磨蚀染色纺织品和修饰其颜色的酶促方法，包括：(a)使纺织品与纤维素酶接触以生物整饰（biopolish)该纺织品；和（b)使纺织品与过水解酶系统接触以修饰该纺织品的颜色；其中（a)和（b)在单浴液中进行。  In one aspect, there is provided a method for dyeing textiles and abrasion modifying its color enzymatic method, comprising: (a) contacting a textile with cellulase biological finished (biopolish) the textile; and (b) reacting Textiles and contacting the perhydrolase system to modify the color of the textile; wherein (a) and (b) in a single bath. 在一些实施方案中，（a)和（b)依次或同时地进行。 In some embodiments, (a) and (b) sequentially or simultaneously. 在一些实施方案中，在（a)之前是酶促退浆步骤，该步骤可以在与（a)和（b)相同的浴液中进行。  In some embodiments, the (a) is an enzymatic desizing step prior to the step may be carried out with (a) and (b) the same bath. 在一些实施方案中，在（b)后是过氧化氢酶的添加，所述的过氧化氢酶可以添加至其中进行（a)和（b)的相同浴液中。 In some embodiments, the (b) is added after the catalase, the catalase may be added to the same bath, and wherein (b) in (a). 在另一个方面，提供了用于磨蚀染色纺织品和修饰其颜色的酶促方法，包括：(a)使纺织品与包含纤维素酶的组合物接触以磨蚀该纺织品；(b)使纺织品与漆酶系统接触以进行该纺织品的第一颜色修饰；和（C)使纺织品与过水解酶系统接触以进行该纺织品的第二颜色修饰；其中通过（b)和（C)组合所产生的总体颜色修饰不同于（b)中的第一颜色修饰和（C)中的第二颜色修饰。  In another aspect, there is provided a method for dyeing textiles and abrasion modifying its color enzymatic method, comprising: (a) contacting a textile with a composition comprising a cellulase abrasion to the textile; (b) a textile contact with the laccase system for modifying a first color of the woven fabric; and (C) a textile perhydrolase enzyme system and contacted to a second modification of the color of the textile; wherein by (B) (C) and the resulting combination overall color is different from the modification (b) modifying the first color and (C) a second color modification. 在一些实施方案中，（b)在（C)之前进行。  In some embodiments, (b) is performed before (C). 在一些实施方案中，（a)和（b)在单浴液中依次或同时地进行。 In some embodiments, (a) and (b) successively or simultaneously in a single bath. 在一些实施方案中，（C)在（b)之前进行。  In some embodiments, (C) is performed before (b). 在一些实施方案中，（a)和（C)在单浴液中依次或同时地进行。 In some embodiments, (a) and (C) sequentially or simultaneously in a single bath. 在一些实施方案中，即，当诸步骤的顺序是（a)、（c)和（b)时，在(b)后是：（d)使纺织品与过水解酶系统接触以进行该染色纺织品的第三颜色修饰。 In some embodiments, i.e., when the order of the various steps is (a), (c) time and (b), (b), after is: (d) a textile perhydrolase enzyme system contacted to the dyed textiles the third color modification. 在一些实施方案中，在（a)之前是酶促退浆步骤，该步骤可以在与（a)相同的浴液中进行。  In some embodiments, the (a) is an enzymatic desizing step prior to the step may be carried out with (a) the same bath. 在一些实施方案中，在（C)后是过氧化氢酶的添加。 In some embodiments, the (C) is added after the catalase. 在一些实施方案中，将过氧化氢酶添加至其中进行（a)、（b)和/或（C)任意者的相同浴液中。 In some embodiments, the catalase is added thereto for (A), the same bath (b) and / or (C) of any of those. 就前述两方面的任一方面而言，在一些实施方案中，纤维素酶是酸性纤维素酶。  For any one of the preceding two aspects, in some embodiments, the cellulase is an acid cellulase. 在一些实施方案中，纤维素酶是中性纤维素酶。 In some embodiments, the cellulase is neutral cellulases. 在一些实施方案中，纤维素酶是碱性纤维素酶。 In some embodiments, the cellulase is an alkaline cellulase. 在一些实施方案中，纤维素酶是纤维素酶的组合。 In some embodiments, the cellulase is a cellulase composition. 在任一前述方面的一些实施方案中，过水解酶系统可以包含过水解酶和酯底物，其中过水解酶以等于或大于I的过水解：水解比率催化酯底物的过水解。  In some embodiments of any aforementioned aspects, the perhydrolase enzyme system may comprise a perhydrolase enzyme and the ester substrate, wherein the perhydrolase enzyme is equal to or greater than I perhydrolysis: hydrolysis ratio catalyze ester substrates perhydrolase. 在一些实施方案中，过水解酶系统包含耻垢分枝杆菌（Mycobacterium smegmatis)过水解酶或其变体。 In some embodiments, the perhydrolase enzyme system comprising a Mycobacterium smegmatis (Mycobacterium smegmatis) or a variant perhydrolase. 在一些实施方案中，过水解酶是耻垢分枝杆菌过水解酶的S54V变体或其变体。 In some embodiments, the perhydrolase is M. smegmatis perhydrolase S54V variant or a variant thereof. 在一些实施方案中,漆酶可以是单色下皮黑孔菌（Cerrena unicolor)漆酶或其变体。  In some embodiments, the laccase may be a monochrome black skin volvatus (Cerrena unicolor) laccase or a variant thereof. 在一些实施方案中，纺织品是粗斜纹棉布（denim)。  In some embodiments, denim textiles (denim). 在一些实施方案中，染料是靛蓝染料。 In some embodiments, the dye is indigo dye. 在一些实施方案中，染料是硫化染料（sulfurdye)。 In some embodiments, the dyes are sulfur dyes (sulfurdye). 在另一个方面，提供了通过前述方法之任意者所产生的纺织品。  In another aspect, a textile produced by the method of any of the preceding. 在具体的实施方案中，纺织品是靛蓝染色的粗斜纹棉布。 In a specific embodiment, the textile is indigo dyed denim. 在具体的实施方案中，纺织品是硫化染料染色的(sulfur-dyed)粗斜纹棉布。 In a specific embodiment, the textile is dyed sulfur (sulfur-dyed) denim. 在另一个方面，提供了用于实施前述方法的组件试剂盒。  In another aspect, there is provided a kit for carrying out the aforementioned method. 本发明组合物和方法的这些方面和其他方面以及实施方案将从本说明书中进一步显而易见。  The compositions and methods of the present invention These and other aspects and embodiments of the present embodiment will be further apparent from the specification. 图I是表格，其显示用锥形粗斜纹棉布（cone denim)XMISP使用本发明组合物和方法的多种实施方案可以获得的示例性修整和颜色。  Figure I is a table showing denim with tapered (cone denim) XMISP trim and use of exemplary embodiments of the various color compositions and methods of the present invention can be obtained. 图2是表格，其显示用锥形粗斜纹棉布4671P使用本发明组合物和方法的多种实施方案可以获得的示例性修整和颜色。  FIG. 2 is a table showing a tapered 4671P denim finishing and color using the exemplary embodiments of the various compositions and methods of the present invention can be obtained. 图3是表格，其显示用锥形粗斜纹棉布8349P使用本发明组合物和方法的多种实施方案可以获得的示例性修整和颜色。  FIG. 3 is a table showing the use of exemplary embodiments of the trim and various color compositions and methods of the present invention can be obtained by the tapered denim 8349P. 图4是表格，其显示用锥形粗斜纹棉布W333使用本发明组合物和方法的多种实施方案可以获得的示例性修整和颜色。  FIG. 4 is a table showing the use of exemplary embodiments of the trim and various color compositions and methods of the present invention can be obtained by the tapered denim W333. 图5是表格，其显示用锥形粗斜纹棉布XOBBP使用本发明组合物和方法的多种实施方案可以获得的示例性修整和颜色。  FIG. 5 is a table showing the use of exemplary embodiments of the trim and various color compositions and methods of the present invention can be obtained by the tapered denim XOBBP. 描述了用于组合的纺织品磨蚀和颜色修饰的酶促组合物和方法。  describes a combination of abrasion and color modifying textiles enzymatic compositions and methods. 在一些实施方案中，组合的磨蚀和颜色修饰在单浴液中进行，无需在加工步骤之间淋洗纺织品。 In some embodiments, a combination of abrasion and color modifications in a single bath, without rinsing between textile processing steps. 在一些实施方案中，磨蚀过程可以与使用不同酶系统如过水解酶系统和漆酶系统的颜色修饰过程组合以产生广泛类型的修整和颜色。 In some embodiments, the abrasive process can be trimmed to produce a wide variety of colors and color modification processes such as the use of perhydrolase enzyme system and laccase systems different combinations of enzyme systems. 在靛蓝和/或硫化染料染色的粗斜纹棉布（即，追随时尚而经历广泛类型的不同化学和物理处理的纺织品）的情况下，本发明的组合物和方法提供了用于获得已知的修整和颜色的全面酶促解决方案并且使得新的修整和颜色成为可能。 In the case of indigo and / or sulfur dye dyeing of denim (i.e., follow fashion textile undergoes chemical and physical treatment of various types of broad), the compositions and methods of the present invention provide for obtaining the known dressing and enzymatic color of comprehensive solutions and make new trim and color possible. 与先前描述的酶促退浆法和漂白清洁法组合时，本发明的组合物和方法进一步满足对具有成本效益、环境友好和充分多功能以产生广泛类型修整和颜色的全套(start-to-finish)酶促纺织加工解决方案的需求。  when a combination of enzymatic desizing and bleaching methods previously described cleaning method, compositions and methods of the present invention further meet the cost-effective, environmentally friendly and sufficiently versatile to produce a wide variety of colors and full trimming (start demand -to-finish) enzymatic textile processing solutions. 这里进一步描述本发明组合物和方法的这些和其他特征和优势。 Further described herein These and other features and advantages of the compositions and methods of the present invention. 在详细描述本发明的组合物和方法之前，出于清晰而定义以下术语。  Before the compositions and methods of the present invention in detail, the following terms are defined for clarity. 未定义的术语应当以它们在相关领域中使用时的通常意思给出。 Terms not defined should be given their usual meaning when used in the related art. 如本文中所用，“过水解酶”是能够催化过水解反应的酶，其中所述过水解反应导致用于如所述的氧化性染料脱色法中的足够高量的过酸产生。  As used herein, "perhydrolase enzyme" is an enzyme capable of catalyzing the hydrolysis reaction, wherein said perhydrolase reaction results in a sufficiently high amount of oxidative dye-bleaching method as described for peracid generation. 通常，过水解酶显示高的过水解/水解比率。 Typically, the perhydrolase exhibits a high perhydrolysis / hydrolysis ratio. 在一些实施方案中，过水解酶包含SEQ ID NO: I中所述的耻垢分枝杆菌过水解酶氨基酸序列或其变体或同源物、由其组成或基本上由其组成。 In some embodiments, the perhydrolase comprises SEQ ID NO: I in the M. smegmatis perhydrolase amino acid sequence or a variant or homologue thereof, consist or consist essentially. 在一些实施方案中， 过水解酶包含酰基转移酶和/或芳基酯酶活性。 In some embodiments, the perhydrolase enzyme comprises acyl transferase enzyme and / or aryl esterase activity. 如本文中所用，术语“过水解反应（perhydrolyzation) ”、“进行过水解(perhydrolyze) ”或“过水解作用”指其中从酯和过氧化氢底物产生过酸的反应。  As used herein, the term "perhydrolysis reaction (perhydrolyzation)", "subjected to hydrolysis (perhydrolyze)" or "over-hydrolysis" refers to a reaction wherein a peracid is generated from ester and hydrogen peroxide substrates. 在一些实施方案中，过水解反应以过水解酶（例如酰基转移酶或芳基酯酶）催化。 In some embodiments, the perhydrolase reaction perhydrolase (e.g., acyl transferase or aryl esterase) catalysis. 在一些实施方案中，在过氧化氢（H2O2)存在下，通过式R1C^ = O)OR2的酯底物的过水解产生过酸，其中R1和R2是相同或不同的有机部分。 In some embodiments, the hydrogen peroxide (H2O2) is present, by the formula R1C ^ = O) OR2 perhydrolase substrate generates an ester peracid, wherein R1 and R2 are the same or different organic moiety. 在一些实施方案中，-OR2 是-OH。 In some embodiments, -OR2 is -OH. 在一些实施方案中，-OR2由-NH2替换。 In some embodiments, -OR2 is replaced by -NH2. 在一些实施方案中，通过羧酸或酰胺底物的过水解产生过酸。 In some embodiments, the peracid produced by perhydrolysis of a carboxylic acid or amide substrate. 如本文中所用，“过水解酶的有效量”指为产生本文中所述脱色效果必需的过水解酶的量。  As used herein, "effective amount of perhydrolase enzyme" refers to an amount described herein to produce the required effect decolorization perhydrolase. 鉴于本说明书，此类有效量由技术人员确定，并且基于几种因素，如所用的具体酶变体、所用的pH、所用的温度等，以及想要的结果（例如，白度水平）。 In view of the present specification, such an effective amount determined by the skilled person, and based on several factors such as the particular enzyme variant used, pH used, the temperature used and the like, as well as the desired result (e.g., level of whiteness). 如本文中所用，术语“过酸”指从羧酸酯衍生的分子，其中所述羧酸酯已经与过氧化氢反应以形成具有通式RC( = O)OOH的高反应性产物。  As used herein, the term "peracid" refers to a molecule derived from a carboxylic acid ester, wherein the carboxylic ester has the hydrogen peroxide to form a highly reactive product OOH having the formula RC (= O) . 此类过酸产物能够将其氧原子之一转移至另一个分子如染料。 Such peracid product is one of an oxygen atom can be transferred to another molecule such as a dye. 正是这种转移氧原子的能力使过酸如过乙酸能够作为漂白剂发挥作用。 It is this ability to transfer oxygen atoms peracid such as peracetic acid capable of functioning as a bleaching agent. 如本文中所用，“酯底物”就含有过水解酶的氧化性染料脱色系统而言指含有酯键的过水解酶底物。  As used herein, "ester substrate" had to contain oxidation dye bleaching system concerned hydrolase refers to perhydrolase enzyme substrate comprising an ester bond. 包含脂族和/或芳族羧酸和醇的酯可以用作过水解酶的底物。 Comprising aliphatic and aromatic ester / or a carboxylic acid and alcohol may be used as a substrate perhydrolase. 在一些实施方案中，酯源是乙酸酯。 In some embodiments, the ester source is an acetate. 在一些实施方案中，酯源选自二乙酸丙二醇酯、二乙酸乙二醇酯、三乙酸甘油酯、乙酸乙酯和三丁酸甘油酯中的一种或多种。 In some embodiments, the ester source is selected from propylene glycol diacetate, one or more of ethylene glycol diacetate, triacetin, ethyl acetate and tributyrin in. 在一些实施方案中，酯源选自一种或多种以下酸的酯：甲酸、乙酸、丙酸、丁酸、戊酸、己酸、辛酸、壬酸、癸酸、十二烷酸、肉豆蘧酸、棕榈酸、硬脂酸和油酸。 In some embodiments, the ester source is selected from one or more esters of the following acids: formic acid, acetic acid, propionic acid, butyric acid, valeric acid, caproic acid, caprylic acid, nonanoic acid, decanoic acid, dodecanoic acid, meat Qu beans acid, palmitic acid, stearic acid and oleic acid. 如本文中所用，术语“过氧化氢源”指能够（例如原位地）产生过氧化氢的分子。  As used herein, the term "hydrogen peroxide source" refers to (e.g. in situ) produced a molecule of hydrogen peroxide. 过氧化氢源包括过氧化氢本身以及自发或酶促产生过氧化氢作为反应产物的分子。 Sources of hydrogen peroxide include hydrogen peroxide itself and molecules spontaneously or enzymatically produce hydrogen peroxide as a reaction product. 此类分子包括例如过硼酸盐和过碳酸盐。 Such molecules include, for example, perborates and percarbonates. 如本文中所用，短语“过水解/水解比率”指在定义条件下和定义时间范围内由过水解酶从酯底物产生的酶促产生过酸与酶促产生酸（例如，以摩尔计）的比率。  As used herein, the phrase "perhydrolysis / hydrolysis ratio" refers to the definition under defined conditions and within a time range produced by the enzymatic and enzymatic peracid perhydrolase generated from the acid generating ester substrates (e.g., to moles) ratio. 在一些实施方案中，使用WO 05/056782中提供的测定法来测定由该酶产生的过酸和酸的量。 In some embodiments, to determine the amount of peracid and acid produced by the enzyme using the assay provided in WO 05/056782. 如本文中所用，术语“酰基”指通过移去-OH基而从有机酸衍生的具有通式RCO-的有机基团。  As used herein, the term "acyl" refers derived by removing -OH from an organic acid group having an organic group of formula RCO-. 一般而言，酰基名称以后缀“-oyl”结尾,例如，甲酰氯（methanoyl chloride)CH3CO-Cl是从甲酸（CH3CO-OH)形成的酰氯。 In general, an acyl group names end with the suffix "-oyl", e.g., chloride (methanoyl chloride) CH3CO-Cl is formed from the carboxylic acid (CH3CO-OH) chloride. 如本文中所用，术语“酰化”指其中某分子的取代基之一被酰基取代的化学转化过程或将酰基导入某分子的过程。  As used herein, the term "acylation" refers to a molecule wherein one of the substituents of the substituted acyl chemical conversion process or an acyl group introduced into a molecule. 如本文中所用，术语“转移酶”指催化官能团从一种底物转移至另一种底物的酶。  As used herein, the term "transferase" refers to catalyze the transfer of functional groups from one substrate to another substrate of the enzyme. 例如，酰基转移酶可以转移来自酯底物的酰基至过氧化氢底物以形成过酸。 For example, acylase can be transferred from the acyl ester substrates to the substrate hydrogen peroxide to form a peracid. 如本文中所用，术语“生成过氧化氢的氧化酶”指催化涉及分子氧作为电子受体的氧化/还原反应的酶。  As used herein, the term "hydrogen peroxide generating oxidase" refers to enzymes involved in the catalytic molecular oxygen as electron acceptor oxidation / reduction reactions. 在这种反应中，氧还原成水（H2O)或过氧化氢（H2O2)。 In this reaction, oxygen is reduced to water (H2O) or hydrogen peroxide (H2O2). 适用于本文中的氧化酶是在其底物上生成过氧化氢（而不是水）的氧化酶。 Suitable for use herein is an oxidase to generate hydrogen peroxide (instead of water) oxidase on a bottom thereof. 生成过氧化氢的氧化酶及其适用于本文中的底物的实例是葡萄糖氧化酶和葡萄糖。 Hydrogen peroxide generating oxidase and examples thereof suitable for use herein are substrates is glucose oxidase and glucose. 可以用于生成过氧化氢的其他氧化酶包括醇氧化酶、乙二醇氧化酶、甘油氧化酶、氨基酸氧化酶等。 Other oxidizing enzymes can be used to generate hydrogen peroxide include alcohol oxidase, ethylene glycol oxidase, glycerol oxidase, amino acid oxidase. 在一些实施方案中，生成过氧化氢的氧化酶是糖氧化酶。 In some embodiments, the hydrogen peroxide generating oxidase is a carbohydrate oxidase. 如本文中所用，“漆酶”是含有多个铜的氧化酶（EC I. 10. 3. 2)，它们通过单电子夺取移除催化酚、多酚、和苯胺的氧化，同时在四电子转移过程中使氧还原成水。  As used herein, "laccase" is a plurality of copper oxidases (EC I. 10. 3. 2), which seize the catalytic removal of phenol, polyphenol, aniline, and through one-electron oxidation, while in the transfer process, to a four-electron reduction of oxygen to water. 如本文中所用，术语“纺织品”指纤维、纱线、织物、服装和非织造物。  As used herein, the term "textile" refers to fibers, yarns, fabrics, garments and non-woven fabrics. 该术语包括从天然、合成（例如，制造的）物质和多种天然及合成混合物制备的纺织品。 The term includes from natural, synthetic (e.g., manufactured) substances and a variety of natural and synthetic textiles mixture prepared. 纺织品可以是未加工或加工的纤维、纱线、织造或编织织物、非织造物和服装，并且可以使用多种材料制得，其中一些材料在本文中提及。 Textile fibers may be unprocessed or processed, yarns, woven or knitted fabrics, nonwovens and garments, and may be prepared using a variety of materials, some of the materials mentioned herein. 如本文中所用，“纤维素性”纤维、纱线或织物至少部分地从纤维素制得。  As used herein, "cellulosic" fiber, yarn or fabric prepared from at least partially made of cellulose. 实例包括棉纤维素性和非棉纤维素性纤维、纱线或织物。 Examples include cotton and non-cotton cellulosic cellulosic fibers, yarn or fabric. 纤维素性纤维可以任选地包括非纤维素性纤维。 Cellulosic fibers may optionally comprise non-cellulosic fibers. 如本文中所用，“非棉纤维素性”纤维、纱线或织物主要包含基于纤维素的组合物而非棉花。  As used herein, "non-cotton cellulosic" fiber, yarn or fabric mainly comprising a cellulose-based composition rather than cotton. 实例包括亚麻（linen)、芒麻、黄麻、亚麻（flax)、人造丝、莱塞尔纤维、乙酸纤维素、竹和从非棉纤维素衍生的其他相似组合物。 Examples include flax (Linen), ramie, jute, flax (Flax), rayon, lyocell, cellulose acetate, bamboo, and other similar compositions derived from non-cotton cellulose. 如本文中所用，“非纤维素性”纤维、纱线或织物主要包含除纤维素之外的材料。  As used herein, "non-cellulosic" fiber, yarn or fabric mainly comprising materials other than cellulose. 实例包括聚酯、尼龙、人造丝、乙酸酯、莱塞尔纤维等。 Examples include polyester, nylon, rayon, acetate, lyocell fiber. 如本文中所用，术语“织物”指制造的纤维和/或纱线组合体，其中所述的组合体相对于其厚度而言具有相当大的表面积和足够内聚性以给予组合体有用的机械强度。  As used herein, the term "fabric" refers to fibers and / or yarns produced combination, wherein said combination has a relatively large surface area and sufficient cohesion to give the assembly in terms of thickness relative to its useful mechanical strength. 如本文中所用，术语“染色”指施加某种颜色（尤其通过浸泡在着色液中）至例如纺织品。  As used herein, the term "stained" means the application of a certain color (especially by immersion in the colored liquid) to, for example textiles. 如本文中所用，术语“染料”指有色物质（即，发色团），其对施加该有色物质的基材具有亲和力。  As used herein, the term "dye" refers to a colored substance (i.e., chromophore), which has an affinity to the substrate is applied to the colored substance. 本文中描述了无数类型的染料。 Described herein, numerous types of dyes. 如本文中所用，术语“颜色修饰”和“颜色调节”无差异地用来指因破坏、修饰或移除与纺织品结合的染料而导致对染色纺织品颜色的任何改变。  As used herein, the term "color modification" and "Color Adjustment" is used to refer indifferently by the destruction, modification, or removal of textile dyes bound to lead to any change in color of dyed textiles. 在一些实施方案中，颜色修饰是脱色（见下文）。 In some embodiments, a color modification bleaching (see below). 颜色修饰的实例包括但不限于漂白、褪色、赋予灰色光（grey cast)、改变色相、饱和度或发光度等。 Color modifications include but are not limited to bleaching, bleaching, imparting light gray (Gray Cast), changing the hue, saturation, luminosity, or the like. 颜色修饰的量和类型可以通过使用已知的分光光度法或目视检查法，比较用过水解酶酶促处理后纺织品的颜色（即，残留色）与酶促处理前纺织品的颜色（即，原色）来确定。 Amounts and types of colors may be modified using known textile color before spectrophotometric or visual inspection methods, comparison color used textile enzymatic hydrolysis process (i.e., residual toner) with enzymatic treatment (i.e., primary color) is determined. 如本文中所用，术语“脱色”和“脱色作用”指通过破坏、修饰或移除染料而（例如从水性介质中）消除或减少颜色。  As used herein, the term "bleaching" and "decolorization" refers to the destruction, modification, or removal of dyes (e.g. from the aqueous medium) to eliminate or reduce color. 在一些实施方案中，脱色或脱色作用定义为从水性介质中移除颜色的百分数。 In some embodiments, bleaching or decolorization is defined as the percentage of color removed from the aqueous medium. 颜色移除的量可以通过使用已知的分光光度法或目视检查法，比较用过水解酶酶促处理后纺织品的颜色（即，残留色）与酶促处理前纺织品的颜色（即，原色）来确定。 The amount of color can be removed by using known spectrophotometric or visual inspection methods, comparison color used textile enzymatic hydrolysis process (i.e., residual toner) before treatment with the enzymatic textile color (i.e., primary colors )to make sure. 如本文中所用，术语“原色”指酶促处理前染色纺织品的颜色。  As used herein, the term "primary color" refers to the color of dyed textiles prior to enzymatic treatment. 原色可以使用已知的分光光度法或目视检查法测量。 Using known primary colors or spectrophotometric measurement visual inspection method. 如本文中所用，术语“残留色”指酶促处理前纺织品的颜色。  As used herein, the term "residual toner" refers to the color of the textile before the enzymatic treatment. 残留色可以使用已知的分光光度法或目视检查法测量。 Residual toner using known spectrophotometric measurement or visual inspection methods. 如本文中所用，术语“浆料”或“上浆料（sizing) ”指在纺织业中用来通过增加纱线的耐磨性和强度而改善织造性能的复合物。  As used herein, the term "slurry" or "slurry on (Sizing)" means to improve weaving performance by increasing the composite yarn strength and abrasion resistance in the textile industry. 浆料通常由例如淀粉或淀粉样复合物制成。 The slurry is typically made of, for example, starch or starch-like composites. 如本文中所用，术语“退浆”或“退浆料”指从纺织品消除浆料（通常是淀粉）的工艺，通常在施加特定整饰剂、染料或漂白剂之前。  As used herein, the term "desizing" or "back slurry" refers to a process eliminates the slurry from textiles (usually starch), and before the specific finishing agents, dye or bleach is usually applied. 如本文中所用，“退浆酶”是用来除去浆料的酶。  As used herein, a "desizing enzyme" is an enzyme used to remove the slurry. 示例性酶是淀粉酶和甘露聚糖酶。 Exemplary enzymes are amylases and mannanases. 如本文中所用，“纤维素酶”是能够水解纤维素的酶。  As used herein, "cellulase" enzyme capable of hydrolyzing cellulose. 如本文中所用，“酸性纤维素酶”是在酸性pH范围例如约pH 4. O至约pH 5. 5内具有最适pH的纤维素酶。  As used herein, "acid cellulase", for example, in the acidic pH range from about pH 4. O to about pH cellulase having a pH optimum within 5.5. 如本文中所用，“中性纤维素酶”是在中性pH范围例如约pH 5. 5至约pH 7. 5内具有最适pH的纤维素酶。  As used herein, a "neutral cellulases" in the neutral pH range, for example from about pH 5. 5 to about pH cellulase having a pH optimum within 7.5. 如本文中所用，“碱性纤维素酶”是在碱性pH范围例如约pH 7. 5至约pH 11内具有最适pH的纤维素酶。  As used herein, "alkaline cellulase", for example, a cellulase having a pH optimum within 7.5 to about pH in the alkaline pH range of about. 11 pH. 如本文中所用，术语“磨蚀”通常指使包含纤维素纤维的纺织品与一种或多种纤维素酶接触以产生效果。  As used herein, the term "abrasive" typically refers to a textile containing cellulosic fibers with one or more cellulases contacting effect. 此类效果包括但不限于局部或完全地使纺织品柔顺、光滑、去绒毛、去球、生物整饰和/或有意磨耗（distress)。 Such effects include but are not limited to, partially or completely a textile soft, smooth, defluff, depilling, biological finishing and / or intentional wear (distress). 在一些情况下，多于一个磨蚀步骤可以是想要的。 In some cases, more than one step can be abrasive want. 如本文中所用，“水性介质”是主要包含水作为溶剂的溶液和/或混悬液。  As used herein, "aqueous medium" comprises water as a main solvent solution and / or suspension. 水性介质一般包括至少一种待脱色的染料以及任意数目的溶解或悬浮的组分，包括但不限于表面活性剂、盐、缓冲剂、稳定剂、络合剂、螯合剂、助洗剂、金属离子、其他酶和底物等。 The aqueous medium typically includes dissolving or suspending the dye components and any number of the at least one decolorizing be, including but not limited to, surfactants, salts, buffers, stabilizers, complexing agents, chelating agents, builders, metal ions, other enzymes and substrates and the like. 示例性水性介质是纺织品染色液。 Exemplary aqueous medium is a textile dyeing solution. 材料如纺织制品、纺织纤维和其他固态材料也可以存在于水性介质中或与之接触。 Materials such as textiles, textile fibers and other solid materials may also be present in an aqueous medium or in contact. 如本文中所用，术语“接触”意指引起物理接触，如通过在含有反应组分（例如，酶）的水溶液存在下孵育对象物（subject item)(例如，纺织品）。  As used herein, the term "contacting" is meant caused by physical contact, such as by incubating an object (subject item) (e.g., textile) in the presence of an aqueous solution containing a reactive component (e.g., enzyme). 如本文中所用，就纺织品的多个酶促处理而言，术语“依次的”意指在进行所指的第一酶促处理后，进行所指的第二酶促处理。  As used herein, in terms of a plurality of enzymatic treatment of textiles, the term "sequential" is meant the enzymatic treatment is performed within the meaning of the first, the second enzymatic process referred to. 依次处理可以被居间洗涤步骤隔开。 Sequentially processing steps may be separated by intervening wash. 在指明的情况下，依次酶促处理可以在相同的浴液中进行，这意指在基本上相同的液态介质中而无居间洗涤步骤。 In the case indicated, the enzymatic treatment may be carried out sequentially in the same bath, which means at substantially the same liquid medium without intervening washing steps. 单浴依次处理可以包括PH调节、温度调节和/或添加盐、活化剂、介质等，但是不应当包括在第一和第二酶促处理之间的洗漆、淋洗或“弃去浴液（dropping thebath)”。 One-bath process may include successively PH, temperature control and / or addition salt thereof, activator, medium, etc., but should not be included in the paint wash between the first and second enzymatic process, leaching or "discarded bath (dropping thebath) ". 如本文中所用，就纺织品的多个酶促处理而言，术语“同时的”意指在与所指的第一酶促处理相同（即，至少部分地与其重叠）的时间进行所指的第二酶促处理。  As used herein, in terms of a plurality of enzymatic treatment of textiles, the term "simultaneously" means that the first enzymatic process within the meaning of the same (i.e., at least partially overlapping with) the time to It refers to a second enzymatic process. 同时酶促处理必须“在相同的浴液中”进行，而无居间洗涤步骤。 Enzymatic treatment must be carried out at the same time "in the same bath" without intervening washing steps. 如本文中所用，“包装物（packaging) ”指能够以易于操作和输送的形式提供过水解酶、过水解酶底物和/或过氧化氢源的容器。  As used herein, "packaging (Packaging)" refers to provide a perhydrolase enzyme in the form of easy to operate and transport, the perhydrolase enzyme substrate and / or a source of hydrogen peroxide in the container. 示例性包装物包括盒、盆、罐、桶、鼓桶、袋或甚至槽车。 Exemplary packages include boxes, pots, cans, barrels, drum, bag or even a tanker. 如本文中所用，术语“纯化的”和“分离的”指从样品移出杂质和/或指从与至少一种其天然结合的组分中移出的物质（例如，蛋白质、细胞、核酸等）。  As used herein, the term "purified" and "isolated" refers to impurities and / or component refers to a substance removed from its naturally associated with at least one sample is removed from (e.g., a protein, cell, nucleic acid Wait). 例如，这些术语可以指这样的材料，所述材料大体上或基本上不含天然状态（完整的生物系统）下存在的通常与其相伴的组分。 For example, these terms may refer to a material normally accompany the presence of component (intact biological systems) said material is substantially or essentially free from native state. 如本文中所用，术语“多核苷酸”指具有任意长度和任意三维结构及单链或多链(例如，单链、双链、三螺旋等）的聚合形式的核苷酸，其含有脱氧核糖核苷酸、核糖核苷酸和/或脱氧核糖核苷酸或核糖核苷酸的类似物或修饰形式，包括修饰的核苷酸或碱基或其类似物。  As used herein, the term "polynucleotide" means a polymeric form of any length and any three-dimensional structure and single or multi-stranded (e.g., single-stranded, double-stranded, triple-helical, etc.) nucleotides, which comprising deoxyribonucleotides, ribonucleotides, and / or analogs or modified forms of deoxyribonucleotides or ribonucleotides, including modified nucleotides or bases or analogs thereof. 因为遗传密码子是简并的，故多于一种密码子可以用来编码特定的氨基酸。 Because the genetic code is degenerate, so that more than one codon may be used to encode a particular amino acid. 可以使用任何类型的修饰核苷酸或核苷酸类似物，只要该多核苷酸在使用条件下保持想要的官能性，包括提高核酸酶抗性的修饰（例如，脱氧、2' -Ο-Me、硫代磷酸酯等）。 Modifications can be used any type of nucleotides or nucleotide analogs so long as the desired functional polynucleotide held under conditions of use, including modifications increase nuclease resistance (e.g., deoxy, 2 '-Ο- Me, phosphorothioates, etc.). 为检测或捕获目的，也可以掺入标记物，例如，放射或非放射性标记物或锚定物（anchor)，例如，生物素。 Purposes to detect or capture, markers may also be incorporated, for example, radioactive or nonradioactive labels or anchors (Anchor), e.g., biotin. 术语多核苷酸也包括肽核酸（PNA)。 The term polynucleotide also includes peptide nucleic acids (PNA). 多核苷酸可以是天然存在或非天然存在的。 The polynucleotide may be a naturally occurring or non-naturally occurring. 术语“多核苷酸”和“核酸”及“寡核苷酸”在本文中互换使用。 The term "polynucleotide" and "nucleic acid" and "oligonucleotide" are used interchangeably herein. 多核苷酸可以含有RNA、DNA或二者和/或其修饰形式和/或类似物。 The polynucleotide may contain RNA, DNA, or both, and / or modified forms and / or the like. 核苷酸的序列可以被非核苷酸组分打断。 The sequence of nucleotides may be interrupted by non-nucleotide components. 一个或多个磷酸二酯键可以由备选的连接基团替换。 One or more phosphodiester linkages may be replaced by alternative linking groups. 这些备选的连接基团包括但不限于这样的实施方案，其中磷酸酯被P (O) S ( “硫代酯”）、P (S) S ( “二硫代酯” )、(O) NR2 ( “酰胺化物”）、P (O) R、P (O)OR1、⑶或CH2( “formacetal”）替换，其中每个R或V独立地是H或取代或未取代的任选含有醚键（-0-)的烷基（1-20个C)、芳基、链烯基、环烷基、环烯基或芳烷基。 These alternative linking groups include, but are not limited to such embodiments wherein phosphate is replaced by P (O) S ( "thioate"), P (S) S ( "dithioate"), (O) NR2 ( "amidate"), P (O) R, P (O) OR1, ⑶ or CH2 ( "formacetal") Alternatively, or V wherein each R is independently H or a substituted or unsubstituted optionally containing an ether alkyl (1-20 C) bond (-0-), aryl, alkenyl, cycloalkyl, cycloalkenyl or aralkyl. 多核苷酸中的全部键并不需要是相同的。 All linkages in a polynucleotide need not be the same. 多核苷酸可以是线形或环状的或者包含线形部分和环状部分的组合。 A polynucleotide can be linear or cyclic or contain a combination of a linear portion and a cyclic portion. 如本文中所用，“多肽”指由氨基酸组成并且由本领域技术人员视作蛋白质的任意组合物。  As used herein, "polypeptide" refers to any combination of amino acids and proteins by those skilled in the art is considered. 本文中使用氨基酸残基的常规单字母或三字母代码。 As used herein, amino acid residues in a conventional one-letter or three-letter code. 术语“多肽”和“蛋白质”在本文中互换地使用并且任意长度的氨基酸聚合物。 The term "polypeptide" and "protein" are used polymers of amino acids of any length and interchangeably herein. 该聚合物可以是线形或分支的，它可以包含修饰的氨基酸，并且它可以由非氨基酸隔断。 The polymer may be linear or branched, it may comprise modified amino acids, and it may be blocked by a non-amino acids. 该术语也包括已经天然地修饰或通过干预（例如，二硫键形成、糖基化、脂质化、乙酰化、磷酸化或任何其他操作或修饰，如以标记组分缀合）而修饰的氨基酸聚合物。 The term also includes modified or have been naturally by intervention (e.g., disulfide bond formation, glycosylation, lipidation, acetylation, phosphorylation, or any other manipulation or modification, such as conjugation to a labeling component) and a modified amino acid polymers. 在该定义范围内还包括例如这样的多肽，它们含有氨基酸的一个或多个类似物（包括例如非天然氨基酸等）以及本领域已知的其他修饰。 Within this definition also comprises, for example, a polypeptide, they contain one or more analogs of an amino acid (including, for example, unnatural amino acids, etc. ), as well as other modifications known in the art. 如本文中所用，认为功能上和/或结构上相似的蛋白质是“相关的蛋白质”。  As used herein, or that functionally and / or structurally similar proteins are "related proteins." 在一些实施方案中，这些蛋白质从不同的属和/或物种衍生，包括生物类别之间的差异（例如，细菌蛋白和真菌蛋白）。 In some embodiments, these proteins are from a different genus and / or species derived, including differences between classes of organisms (e.g., a bacterial protein and a fungal protein). 在额外的实施方案中，提供来自相同物种的相关蛋白。 In additional embodiments, the providing of related proteins from the same species. 实际上，不意图将本文中所述的工艺、方法和/或组合物限于来自任何具体来源的相关蛋白。 Indeed, not intended to processes described herein, a method and / or composition is limited to related proteins from any particular source. 此外，术语“相关蛋白”包含三级结构同源物和一级序列同源物。 Further, the term "related proteins" encompasses tertiary structural homologs and primary sequence homologs. 在其他实施方案中，该术语包含具有免疫学交叉反应性的蛋白质。 In other embodiments, the term encompasses proteins having immunological cross-reactivity. 如本文中所用，术语“衍生物”指从一种蛋白质中通过添加一个或多个氨基酸至C末端或N-末端或两个末端、在氨基酸序列中一个或多个不同位点处置换一个或多个氨基酸、和/或在该蛋白质的任一端或两端或在氨基酸序列中一个或多个位点处删除一个或多个氨基酸、和/或在氨基酸序列中一个或多个位点处插入一个或多个氨基酸而衍生的蛋白质。  As used herein, the term "derivative" refers to a protein by the addition of one or more amino acids to N- terminus or C-terminus or both termini, the amino acid sequence at one or more different sites substitution of one or more amino acids and / or either or both ends of the protein or at one or more sites in the amino acid deletion of one or more amino acid sequences, and / or at one or more sites in the amino acid sequence the insertion of one or more amino acids derived protein spots. 蛋白质衍生物的制备优选地通过修饰编码天然蛋白的DNA序列、将该DNA序列转化入合适的宿主并且表达修饰的DNA序列以形成衍生蛋白来实现。 Preparation of a protein derivative is preferably achieved by modifying a DNA sequence encoding the native protein, the DNA sequence transformed into a suitable host and expression of the modified DNA sequence to form the derivative protein achieved. 相关（和衍生）蛋白包含“变体蛋白”。  Related (and derivative) proteins comprise "variant proteins." 在一些实施方案中，变体蛋白因少数氨基酸残基而不同于亲代蛋白，例如野生型蛋白，并且彼此不同。 In some embodiments, variant proteins by a few amino acid residues differ from the parent protein, such as a wild-type protein, and different from each other. 不同氨基酸残基的数目可以是一个或多个，例如，1、2、3、4、5、10、15、20、30、40、50个或更多个氨基酸残基。 The number of different amino acid residues may be one or more, e.g., 1,2,3,4,5,10,15,20,30,40,50 or more amino acid residues. 在一些方面，相关蛋白且特别是变体蛋白包含至少35%、40%、45%、50%、55%、60%、65%、70%、75%、80%、85%、90%、91%、92%、93%、94%、95%、96%、97%、98%或甚至99%或更多的氨基酸序列同一性。 In some aspects, related proteins and particularly variant proteins comprise at least 35%, 40%, 45%, 50%, 55%, 60%, 65%, 70%, 75%, 80%, 85%, 90%, 91%, 92%, 93%, 94%, 95%, 96%, 97%, 98% or even 99% or more amino acid sequence identity. 额外地，相关蛋白或变体蛋白指与在主要区域的数目上不同于另一种相关蛋白或亲代蛋白的蛋白质。 Additionally, related protein or a variant protein refers to protein differs from another related protein or a parent protein in the number of the primary zone. 例如，在一些实施方案中，变体蛋白具有1、2、3、4、5或10个不同于亲本蛋白的相应主要区域。 For example, in some embodiments, variant proteins have 1, 2, 10 or respective main regions identical to the parent protein. 主要区域包括结构性特征、保守区、表位、结构域、基序等。 The main structural feature region includes, conserved regions, epitopes, domains, motifs and the like. 适于产生本文中所述酶变体的方法是本领域已知的，包括但不限于位点饱和诱变、扫描诱变、插入诱变、随机诱变、位点定向诱变和定向进化以及多种其他重组方法。  The method described herein is adapted to produce the enzyme variants are known in the art, including but not limited to site-saturation mutagenesis, scanning mutagenesis to, insertional mutagenesis, random mutagenesis, site-directed mutagenesis and directed evolution as well as a variety of other recombinant methods. 注意在指明某变体多肽中的具体突变的情况下，该变体多肽的进一步变体保留所指明的突变并且在未指明的其他位置处变化。 Note that a specific mutation in the variant polypeptide specified in the case of the variant polypeptide further variant retains mutations and other changes at the specified positions in unspecified. 如本文中所用，术语“类似序列”指在蛋白质内部的提供与目的蛋白（即，通常是原始目的蛋白）相似的功能、二级结构和/或保守残基的序列。  As used herein, the term "analogous sequence" refers to a protein within the protein provides (i.e., typically the original protein of interest) similar function, secondary structure sequence and / or conserved residues. 例如，在含有α螺旋或β折叠结构的表位区域中，类似序列中的替换氨基酸优选地维持相同的特定结构。 For example, in epitope region containing α-helix or β-sheet structure, the replacement amino acid sequence similar to preferably maintain the same specific structure. 该术语也指核苷酸序列和氨基酸序列。 The term also refers to nucleotide and amino acid sequences. 在一些实施方案中，开发类似序列，从而替换性氨基酸产生了显示相似或改善功能的变体酶。 In some embodiments, analogous sequences are developed, thus replacing amino acid produced showed a similar or improved function of the variant enzyme. 在一些实施方案中，目的蛋白中的三级结构和/或保守氨基酸残基位于目的节段或片段处或其附近。 In some embodiments, the tertiary structure of the protein and / or conserved amino acid residues located at or near the segment or segments purposes. 因而，在目的节段或片段含有例如α螺旋或β折叠结构的情况下，替换氨基酸优选地维持这种特定结构。 Accordingly, the object of the segment or segments containing the α helix or a case where, for example, β-sheet structure, the replacement amino acids preferably maintain that specific structure. 如本文中所用，术语“同源蛋白”指具有与参比蛋白相似的活性和/或结构的蛋白质。  As used herein, the term "homologous protein" refers to a protein having similar activity than the reference protein and / or structures. 同源物不意图必需是进化上相关的。 Homologue no intention must be evolutionarily related. 因而，该术语意图包括从不同生物获得的相同、相似或对应的酶（即，就结构和功能而言）。 Thus, the term is intended to include identical obtained from different organisms, like or corresponding enzymes (i.e., in terms of structure and function). 在一些实施方案中，想要鉴定具有与参比蛋白相似的四级、三级和/或一级结构的同源物。 In some embodiments, identifying a desired ratio of the reference protein similar quaternary, tertiary and / or primary structure homolog. 在一些实施方案中，同源蛋白诱导与参比蛋白相似的免疫应答。 In some embodiments, homologous proteins induce similar immunological reference response than protein. 在一些实施方案中，工程设计同源蛋白以产生具有所希望活性的酶。 In some embodiments, the homologous protein engineering to produce enzymes having the desired activity. 序列之间的同源性程度可以使用本领域已知的任何适用方法（见，例如，Smith和Waterman, (1981) Adv. Appl. Math. 2 ：482 ；Needleman 和ffunsch, (1970) J. Mol. Biol. ,48 ：443 ；Pearson 和Lipman, (1988) Proc. Natl. Acad. Sci. USA 85 :2444 ;程序如Wisconsin 遗传学软件包（GeneticsComputer Group,Madison, WI)中的GAP、BESTFIT、FASTA 和TFASTA ;和Devereux 等人,(1984)Nucleic Acids Res. 12 :387-395)确定。  The degree of homology between sequences may be used in any suitable method known in the art (see, e.g., Smith and Waterman, (1981) Adv Appl Math 2:... 482; Needleman and ffunsch, (1970) . J. Mol Biol, 48: 443; Pearson and Lipman, (1988) Proc Natl Acad Sci USA 85:. 2444; programs such as the Wisconsin genetics Software package (GeneticsComputer Group, Madison, WI) in the GAP,.... . BESTFIT, FASTA, and TFASTA in; and Devereux et al., (1984) Nucleic Acids Res 12: 387-395) determined. 例如，PILEUP是测定序列同源性水平的有用程序。  For example, PILEUP is a useful measurement program sequence homology levels. 使用累进配对比对法，PILEUP从一组相关序列产生多重序列比对结果。 Progressive method using pairwise alignments, PILEUP from a group of related sequences to generate multiple sequence alignments. 它也可以绘制用来产生比对结果的显示聚类关系的树。 It can also plot a tree display clustering relationships used to create the alignment results. PILEUP 使用Feng 和Doolittle 累进比对法（Feng 和Doolittle，(1987) J. Mol.Evol. 35 :351-360)的简化形式。 PILEUP uses Feng and Doolittle method progressive alignment (Feng and Doolittle, (1987) J. Mol.Evol 35: 351-360.) In simplified form. 该方法与Higgins和Sharp描述的方法（Higgins和Sharp (1989) CABIOS 5 :151-153)相似。 Method The method described by Higgins and Sharp (Higgins and Sharp (1989) CABIOS 5: 151-153) similar. 有用的PILEUP参数包括默认空位权重3. 00、默认空位长度权重0. 10和权重的末端空位。 Useful PILEUP parameters including a default gap weight of 3.00, a default gap length weight of 0.10, and weighted end gaps. 另一个有用算法的例子是由Altschul等人（Altschul等人(1990)，J. Mol. Biol. 215 :403-410 ;和Karlin 等人，(1993)Proc. Natl. Acad. Sci. USA90 :5873-5787)描述的BLAST算法。 Another example of a useful algorithm is described in Altschul et al (Altschul et al. (1990), J Mol Biol 215: 403-410; and Karlin et al., (1993) Proc Natl Acad Sci USA90:... 5873.... -5787) BLAST algorithm described. 一个特别有用的BLAST程序是WU-BLAST-2程序（见，Altschul 等人，(1996)Meth. Enzymol. 266 =460-480)。 A particularly useful BLAST program is the WU-BLAST-2 program (See, Altschul et al., (1996) Meth. Enzymol. 266 = 460-480). 参数“W”、“T”和“X”决定比对的灵敏度和速度。 Parameters "W", "T" and "X" determines the sensitivity and speed of the alignment. BLASTP程序使用字长度（W)11、BL0SUM62评分矩阵（见，Henikoff和Henikoff，(1989)Proc. Natl. Acad. Sci. USA 89 :10915)、比对（B) 50、期望（E) 10、M' 5、N' _4 和比较两条链作为默认值。 The BLASTP program uses a word length (W) 11, BL0SUM62 scoring matrix (see, Henikoff and Henikoff, (1989) Proc Natl Acad Sci USA 89:.... 10915), alignments (B) 50, expectation (E) 10, M '5, N' _4 and a comparison of both strands as a default value. 如本文中所用，在至少两条核酸或多肽的上下文中，短语“基本上相似的”和“基本上相同的”一般意指多核苷酸或多肽包含与参比（即，野生型）序列相比，具有至少约40%同一性、更优选至少约50%同一性、仍更优选至少约60%同一性、优选至少约75%同一性、更优选至少约80%同一性、仍更优选至少约90%、至少约91 %、至少约92%、至少约93%、至少约94%、至少约95%、至少约96%、至少约97%、至少约98%或甚至至少约99%序列同一性的序列。  As used herein, at least in the context of two nucleic acids or polypeptides, the phrase "substantially similar" and "substantially the same" generally means a polynucleotide or polypeptide comprises a reference (i.e., wild-type ) compared to sequences having at least about 40% identity, more preferably at least about 50% identity, still more preferably at least about 60% identity, preferably at least about 75% identity, more preferably at least about 80% identity, still more preferably at least about 90%, at least about 91%, at least about 92%, at least about 93%, at least about 94%, at least about 95%, at least about 96%, at least about 97%, at least about 98%, or even at least about 99% sequence identity. 序列同一性可以使用已知程序如BLAST、ALIGN和CLUSTAL，使用标准参数确定。 Sequence identity can be used known procedures such as BLAST, ALIGN, and CLUSTAL, determined using standard parameters. (见例如，Altschul 等人. (1990) J. Mol. Biol. 215 :403-410 ;Henikoff 等人· (1989)Proc. Natl. Acad. Sci. USA 89 :10915 ;Karin 等人（1993) Proc. Natl. Acad. Sci USA 90:5873 ;和Higgins等人· (1988) Gene 73 =237-244)。 . (See, for example, Altschul et al. (1990) J. Mol Biol 215: 403-410; Henikoff et al · (1989) Proc Natl Acad Sci USA 89:. 10915; Karin et al. (1993) Proc.... .. Natl Acad Sci USA 90:. 5873; and Higgins et al · (1988) Gene 73 = 237-244). 用于进行BLAST分析的软件是通过国家生物技术信息中心可公开获得的。 Software for performing BLAST analysis is through the National Center for Biotechnology Information publicly available. 另外，使用FASTA(Pearson等人.（1988)Proc. Natl.Acad. Sci. USA 85 :2444-2448)，可以搜索数据库。 Further, using the FASTA (Pearson et al. (1988) Proc Natl.Acad Sci USA 85:.... 2444-2448), you can search the database. 两个多肽基本上相同的一个指标是第一多肽与第二多肽发生免疫学交叉反应。 Two indicator polypeptide is substantially identical to a second polypeptide with the first polypeptide is immunologically cross-reactive. 一般而言，因保守性氨基酸置换而不同的多肽是有免疫学交叉反应性的。 In general, due to conservative amino acid substitutions that differ polypeptide is immunologically cross-reactive. 因而，例如，在两个肽仅因保守性置换而不同的情况下，第一个多肽与第二多肽基本上相同。 Thus, for example, in the two peptides differ only by conservative substitutions are different, the first polypeptide and second polypeptide is substantially the same. 两个核酸序列基本上相同的另一个指标是这两个分子在严格条件(例如，中等至高严格性的范围内）下相互杂交。 Another indication that two nucleic acid sequences are substantially identical is that the two molecules hybridize to each other under stringent conditions (e.g., within a range of medium to high stringency) below. 如本文中所用，“野生型”和“天然”蛋白是在自然界中存在的那些蛋白质。  As those proteins used herein, "wild-type" and "native" proteins are present in nature. 术语“野生型序列”和“野生型基因”在本文中互换地用来指宿主细胞中固有或天然存在的序列。 The term "wild-type sequence" and "wild-type gene" are used interchangeably herein to refer to the natural sequence or a host cell naturally occurring. 在一些实施方案中，野生型序列指作为蛋白质工程化项目起点的目的序列。 In some embodiments, the wild-type sequence refers to a sequence as the starting point of a protein engineering project. 编码天然存在蛋白的基因可以根据本领域技术人员已知的一般方法获得。 A gene encoding a naturally-occurring protein may be obtained according to general methods known to the skilled person. 所述方法总体上包括合成具有推定序列（其编码目的蛋白的区域）的标记探针、从表达该蛋白质的生物制备基因组文库和通过与所述探针杂交对文库筛选目的基因。 The method comprises synthesizing labeled probes having putative sequences (the region which encodes the protein) as a whole, from genomic libraries prepared organisms expressing the protein, and by said probe hybridizes to the gene library screening. 随后将阳性杂交克隆作图并测序。 Positively hybridizing clones are then plotted and sequenced. 如本文中所用，单数冠词“一个（a)”、“一种（an)”和“该（the) ”包括复数称谓，除非上下文另外清楚地说明并非如此。  As used herein, the singular article "(A)", "one kind (AN)" and "the (The)" include plural referents unless the context clearly indicates otherwise. 本文中提到的全部参考文献因而通过引用的方式完整并入本文作为参考。 All references mentioned herein by reference in its entirety and therefore incorporated herein by reference. 在一些实施方案中，颜色修饰在与磨蚀过程相同的浴液中使用一种或多种纤维素酶依次或同时进行。  In some embodiments, a color modification using one or more cellulase abrasion process with the same bath sequentially or simultaneously. 纤维素酶一般在用过水解酶系统或漆酶系统处理之前或与之同时使用。 Cellulases are normally used in paint systems or hydrolase enzyme system used before or simultaneously therewith. 在一些实施方案中，多种纤维素酶可以在不同的步骤中一起或分别地使用。 In some embodiments, more cellulase may be used together or separately in different steps. 将纤维素酶划分于包含内切和外切活性以及纤维二糖水解能力的酶家族中。  The division in the cellulase containing endo- and exo-cellobiohydrolase activity and the ability of an enzyme family. 基于它们的最适pH，纤维素酶也表征为酸性纤维素酶、中性纤维素酶或碱性纤维素酶。 Based on the pH optimum thereof, cellulases are also characterized as acid cellulase, alkaline or neutral cellulases cellulases. 纤维素酶可以从已知能够产生纤维素裂解酶的微生物，例如木霉属(Trichoderma)、腐质霉属（Humicola)、镰孢霉属（Fusarium)、曲霉属（Aspergillus)、嗜热真菌属（Thermomyces)、芽胞杆菌属（Bacillus)、毁丝霉属（Myceliophthora)、平革菌属(Phanerochaete)、fEl齿菌属（Irpex)、柱霉属（Scytalidium)、裂裙菌属（Schizophyllum)、青霉属(Penicillium)、地霉属(Geotricum)和圆抱霉属(Staphylotrichum)物种衍生。  cellulase may be from a microorganism known to produce cellulolytic enzymes, e.g. Trichoderma (Trichoderma), Humicola (Humicola), Fusarium (of Fusarium), Aspergillus (Aspergillus), addicted thermal fungal genera (Thermomyces), Bacillus (Bacillus), Myceliophthora (Myceliophthora), Phanerochaete (Phanerochaete), fEl genus teeth (Irpex), Rhizopus column (Scytalidium), split skirt genus ( Schizophyllum), Penicillium (Penicillium), Geotrichum (Geotricum) and a circular holding Geotrichum (Staphylotrichum) species derived. 能够产生纤维素裂解酶的已知物种包括Humicola insolens、尖孢镰孢霉（Fusariumoxysporum)或里氏木霉（Trichoderma reesei)。 Capable of producing cellulolytic enzymes include known species Humicola insolens, Fusarium oxysporum (Fusariumoxysporum) or T. reesei (Trichoderma reesei). 示例性纤维素酶包括来自链霉菌属物种(Streptomyces sp. ) 11AG8的内切葡聚糖酶、来自大孢圆孢霉(Staphylotrichumcoccosporum)和Humicola insolens的中性纤维素酶和来自里氏木霉（T. reesei)的单种纤维素酶和纤维素酶掺合物。 Exemplary cellulases include species from the genus Streptomyces (Streptomyces sp.) Endoglucanases 11AG8 of from Neurospora large circle Mortierella (Staphylotrichumcoccosporum) and Humicola insolens and neutral cellulases from Trichoderma reesei ( T. reesei) of a single cellulase and cellulase blend. 合适纤维素酶的非限制性实例在美国专利号4，435，307 ;欧洲专利申请号EPO 495 257 和EP 271 004 ;和PCT 专利申请号TO91/17244、TO92/06221、TO98/003667、W001/090375, W005/054475 和W005/056787 中公开。  Nonlimiting examples of suitable cellulases in U.S. Patent No. 4,435,307; European Patent Application No. EPO 495 257 and EP 271 004; and PCT Patent Application No. TO91 / 17244, TO92 / 06221, TO98 / 003667 , in W001 / 090375, W005 / 054475 and W005 / 056787 discloses. 在一些实施方案中，纤维素酶可以按照以织物重量计约O. 0001%至约1%酶蛋白如以织物重量计约O. 0001%至约O. 05%酶蛋白或以织物重量计约O. 0001至约O. 01%酶蛋白的范围内的浓度使用。  In some embodiments, the cellulase according to weight of the fabric may be about O. 0001% to about 1% of enzyme protein by weight of the fabric, such as from about O. 0001% to about O. 05% enzyme protein or fabric weight of from about 0001 to about O. O. concentration in the range of 01% of enzyme protein used. 纤维素分解活性可以通过测量该酶降低羧甲基纤维素（CMC)溶液黏度的能力以外切纤维素酶单位（ECU)来确定。  cellulolytic enzyme activity may be measured by a decrease of carboxymethyl cellulose (CMC) solution viscosity than the ability of endo-cellulase units (ECU) is determined. ECU测定法通过测量该样品降低羧甲基纤维素（CMC)溶液黏度的能力而量化在样品中存在的催化活性的量。 ECU assay the amount of catalytic activity present in the sample by measuring the decrease of the sample carboxymethyl cellulose (CMC) solution viscosity of the quantization capability. 该测定法在振动粘度计（例如，来自法国Sofraser的MIVI3000)中在40°C ；pH 7. 5 ；0. IM磷酸盐缓冲液中实施；时间30分钟，使用降低CHIC底物黏度的相对酶标准物（Hercules 7 LED)，酶浓度大约是O. 15 E⑶/mL。 The assay in a vibration viscosimeter (e.g., MIVI3000 from Sofraser, France) at 40 ° C; pH 7. 5;. 0 IM phosphate buffer embodiment; time of 30 minutes, using a reduced viscosity of the CHIC substrate relative to the enzyme standards (Hercules 7 LED), enzyme concentration is about O. 15 E⑶ / mL. 主要标准物（arch standard)定义为8200E⑶/g。 Primary standard (arch standard) is defined as 8200E⑶ / g. 一个E⑶是这些条件下降低黏度至一半黏度的酶量。 E⑶ a low viscosity decreased to these conditions is the amount of enzyme half viscosity. 本发明的组合物和方法利用过水解酶酶系统，其包含在合适的酯底物和过氧化氢源存在下能够产生过酸的过水解酶。  The compositions and methods of the present invention using a perhydrolase enzyme system comprising at appropriate ester substrate and hydrogen peroxide source capable of generating peracid present perhydrolase. 在一些实施方案中，该过水解酶是天然存在的酶。  In some embodiments, the perhydrolase enzyme is a naturally occurring enzyme. 在一些实施方案中，过水解酶包含与天然存在的过水解酶的氨基酸序列至少约70%、75%、80%、85%、90%、91%、92%、93%、94%、95%、96%、97%、98%、99%或甚至99. 5%同一的氨基酸序列、由其组成或基本上由其组成。 In some embodiments, the perhydrolase enzyme comprises the amino acid sequence of a perhydrolase enzyme naturally occurring least about 70%, 75%, 80%, 85%, 90%, 91%, 92%, 93%, 94%, 95 %, 96%, 97%, 98%, 99% or even 99.5% identical to the amino acid sequence, consist or consist essentially. 在一些实施方案中，该过水解酶来自微生物源，如细菌或真菌。 In some embodiments, the perhydrolase enzyme from a microbial source such as bacteria or fungi. 在一些实施方案中，该过水解酶是天然存在的耻垢分枝杆菌过水解酶或其变体。  In some embodiments, the smegmatis perhydrolase enzyme is a naturally occurring perhydrolase mycobacterial or a variant thereof. 这种酶、其酶特性、其结构及其众多变体和同源物在通过引用方式并入的国际专利申请公开TO 05/056782A 和WO 08/063400A 和美国专利申请公开US2008145353 和US2007167344中详细描述。 This enzyme, which enzyme properties, its structure and its many variants and homologs are incorporated by reference in International Patent Application Publication TO 05 / 056782A and WO 08 / 063400A and U.S. Patent Application Publication US2008145353 and US2007167344 described in detail in . 在一些实施方案中，该过水解酶具有至少I的过水解：水解比率。 Perhydrolase  In some embodiments, the perhydrolase having at least I: hydrolysis ratio. 在一些实施方案中，该过水解酶具有大于I的过水解：水解比率。 In some embodiments, the perhydrolase perhydrolysis greater than I: hydrolysis ratio. 在一些实施方案中，过水解：水解比率大于I. 5、大于2. O、大于2. 5或甚至大于3. O。 In some embodiments, the perhydrolysis: hydrolysis ratio is greater than I. 5, greater than 2. O, greater than 2.5 or even greater than 3. O. 这些高的过水解：水解比率是耻垢分枝杆菌过水解酶及其变体独特的特征。 These high perhydrolysis: hydrolysis ratio is M. smegmatis perhydrolase had unique characteristics and variants thereof. 在一些实施方案中，过水解酶包含SEQ ID NO : I中所述的氨基酸序列或其变体或同源物、由其组成或基本上由其组成。  In some embodiments, the perhydrolase comprises SEQ ID NO: I in the amino acid sequence, or a variant or homolog thereof, consist or consist essentially. 在一些实施方案中，该过水解酶包含与SEQ ID NO：I 中所述的氨基酸序列至少约70%、75%、80%、85%、90%、91%、92%、93%、94%、95%、96%,97%,98%,99%或甚至99. 5%同一的氨基酸序列、由其组成或基本上由其组成。 In some embodiments, the perhydrolase comprises SEQ ID NO: I in the amino acid sequence of at least about 70%, 75%, 80%, 85%, 90%, 91%, 92%, 93%, 94 %, 95%, 96%, 97%, 98%, 99% or even 99.5% identical to the amino acid sequence, consist or consist essentially. 在一些实施方案中，该过水解酶包含在与SEQ ID NO : I中所述耻垢分枝杆菌过水解酶氨基酸序列中的位置等同的一个或多个氨基酸位置处的一个或多个置换。  In some embodiments, the perhydrolase enzyme comprises at SEQ ID NO: I in the M. smegmatis through one or more of the amino acid sequence hydrolase equivalent to position one or more amino acid positions permutation. 在一些实施方案中，该过水解酶包含选自Ml，K3，R4，15，L6，C7，DIO, Sll, L12，T13，W14, W16, G15，V17,P18, V19, D21, G22, A23, P24, T25, E26, R27, F28, A29, P30, D31, V32, R33, W34, T35, G36,L38, Q40, Q41, D45, L42, G43, A44, F46, E47, V48, 149，E50, E51, G52, L53, S54, A55, R56,T57, T58, N59, 160，D61, D62, P63, T64, D65, P66, R67, L68, N69, G70, A71, S72, Y73, S76,C77, L78, A79, T80, L82, P83, L84, D85, L86, V87, N94, D95, T96, K97, Y99F100, R101, R102,P104, L105, D106, 1107，A108, L109, G110, Mill, S112, V113, L114, V115, T116, Q117, V118,L119, T120, S121, A122, G124, V125, G126, T127, T128, Y129, P146, P148, W149, F150, 1153，F154，1194，和F196的氨基酸置换中的任一者或任意组合。 In some embodiments, the perhydrolase enzyme comprises selected from Ml, K3, R4,15, L6, C7, DIO, Sll, L12, T13, W14, W16, G15, V17, P18, V19, D21, G22, A23 , P24, T25, E26, R27, F28, A29, P30, D31, V32, R33, W34, T35, G36, L38, Q40, Q41, D45, L42, G43, A44, F46, E47, V48, 149, E50 , E51, G52, L53, S54, A55, R56, T57, T58, N59, 160, D61, D62, P63, T64, D65, P66, R67, L68, N69, G70, A71, S72, Y73, S76, C77 , L78, A79, T80, L82, P83, L84, D85, L86, V87, N94, D95, T96, K97, Y99F100, R101, R102, P104, L105, D106, 1107, A108, L109, G110, Mill, S112 , V113, L114, V115, T116, Q117, V118, L119, T120, S121, A122, G124, V125, G126, T127, T128, Y129, P146, P148, W149, F150, 1153, F154,1194, and the F196 amino acid substitutions in any one or any combination thereof. 在一些实施方案中，该过水解酶包含在与SEQ ID NO : I中所述耻垢分枝杆菌过水解酶氨基酸序列中的位置等同的一个或多个氨基酸位置处的一个或多个以下置换：L12C、Q或G ;T25S、G 或P ;L53H、Q、G 或S ;S54V、LA、P、T 或R ；A55G 或T ;R67T、Q、N、G、E、L 或F ;K97R ;V125S、G、R、A 或P ；F154Y ;F196G。  In some embodiments, the perhydrolase enzyme comprises at SEQ ID NO: I in the M. smegmatis through one or more of the amino acid sequence hydrolase equivalent to position one or more amino acid positions or less substitutions: L12C, Q, or G; T25S, G, or P; L53H, Q, G or S; S54V, LA, P, T or R; A55G or T; R67T, Q, N, G, E, L, or F; K97R; V125S, G, R, A or P; F154Y; F196G. 在一些实施方案中，该过水解酶包含在与SEQ ID NO : I中所述耻垢分枝杆菌过水解酶氨基酸序列中的氨基酸位置等同的氨基酸位置处的氨基酸置换的组合：L12I S54V ；L12M S54T ；L12T S54V ；L12Q T25SS54V ；L53H S54V ；S54P V125R ；S54V V125G ；S54V F196G ；S54VK97R V125G;或A55G R67T K97R V125G。  In some embodiments, the perhydrolase enzyme comprises at SEQ ID NO: I in the M. smegmatis by combining amino acid substitution at amino acid position the amino acid position in the amino acid sequence hydrolase equivalent: L12I S54V; L12M S54T; L12T S54V; L12Q T25SS54V; L53H S54V; S54P V125R; S54V V125G; S54V F196G; S54VK97R V125G; or A55G R67T K97R V125G. 在一些实施方案中，该过水解酶包括S54V置换，但是另外与SEQID N0:1或3中所述的氨基酸序列至少约70%,75%,80%,85%,90%,91%,92%,93%,94%,95%,96%,97%、98%、99%或甚至99. 5% 同一。  In some embodiments, the perhydrolase enzyme comprises substitution S54V, but otherwise with SEQID N0: amino acid sequence of claim 1 or 3, at least about 70%, 75%, 80%, 85%, 90%, 91 %, 92%, 93%, 94%, 95%, 96%, 97%, 98%, 99% or even 99.5% identical. 在一些实施方案中，该过水解酶以约I至约IOOppm或更大的浓度提供。  In some embodiments, the perhydrolase enzyme is a concentration of from about I to about IOOppm or more provided. 在一些实施方案中，以相对于纺织品上染料的量而言的摩尔比提供该过水解酶。 In some embodiments, a molar ratio with respect to the amount of dye on the textile terms providing the perhydrolase. 在一些实施方案中，该摩尔比是约1/10000至约1/10，或甚至约1/5000至约1/100。 In some embodiments, the molar ratio is from about 1/10000 to about 1/10, or even from about 1/5000 to about 1/100. 在一些实施方案中，过水解酶的浓度是约1(Γ9Μ至约1(Γ5Μ、约1(Γ8Μ至约1(Γ5Μ、约1(Γ8Μ至约1(Γ6Μ、约5Χ 1(Γ8Μ至约5Χ10_7Μ或甚至约10_7Μ至约5Χ10_7Μ。在一些实施方案中，过水解酶的量低于预定量以改善颜色修饰效率。 In some embodiments, the concentration of hydrolase is from about 1 (Γ9Μ to about 1 (Γ5Μ, about 1 (Γ8Μ to about 1 (Γ5Μ, about 1 (Γ8Μ to about 1 (Γ6Μ, about 5Χ 1 (Γ8Μ about 5Χ10_7Μ or even from about to about 10_7Μ 5Χ10_7Μ. in some embodiments, the amount of perhydrolase enzyme is less than a predetermined amount in order to improve the efficiency of color modification. 过水解酶系统可以包括至少一种酯分子，所述酯分子充当过水解酶的底物用于在过氧化氢存在下产生过酸。  perhydrolase enzyme system may comprise at least one ester molecule, ester molecule acts as the perhydrolase enzyme substrate used to produce peracid in the presence of hydrogen peroxide. 在一些实施方案中，酯底物是脂族和/或芳族羧酸或醇的酯。 In some embodiments, the ester substrate is an aliphatic and / or aromatic carboxylic acids or alcohols. 酯底物可以是单价、二价或多价酯或其混合物。 Ester substrate may be a monovalent, divalent or polyvalent acrylates or mixtures thereof. 例如，酯底物可以是一个羧酸和一元醇(single alcohol)(单价，例如，乙酸乙酯、乙酸丙酯）、二个羧酸和一个二醇[例如，二乙酸丙二醇酯（PGDA)、二乙酸乙二醇酯（EGDA)或其混合物，例如，2-乙酰氧基1_丙酸酯，其中丙二醇在醇基2上具有乙酸酯并且在醇基I上具有丙基酯]或三个羧酸和一个三醇（例如， 三乙酸甘油酯或者与甘油或另一个多元醇连接的乙酸酯/丙酸酯的混合物等）。 For example, the ester substrate may be a carboxylic acid and a monohydric alcohol (single alcohol) (monovalent, e.g., ethyl acetate, propyl acetate), a carboxylic acid and two diols [e.g., propylene glycol diacetate (PGDA), ethylene glycol diacetate (EGDA), or mixtures thereof, e.g., 2-acetoxy-propionate 1_, wherein propylene glycol acetate in an alcohol having 2-propyl ester and having on alcohol I] or tris carboxylic acid and a triol (e.g., acetate, or glyceryl triacetate and glycerol or other polyhydric alcohols connection / propionate mixture, etc.). 在一些实施方案中，酯底物是硝基醇（例如，2-硝基-I-丙醇）的酯。  In some embodiments, the ester substrate is nitro alcohols (e.g., 2-nitro-propanol -I-) ester. 在一些实施方案中，酯底物是聚合酯，例如，部分酰化（乙酰化、丙酰化等）的聚羧基醇、乙酰化淀粉等。 In some embodiments, the ester substrate is polymeric esters, for example, partially acylated (acetylated, propionylated, etc.) polycarboxy alcohols, acetylated starch. 在一些实施方案中，酯底物是选自一种或多种以下酸的酯：甲酸、乙酸、丙酸、丁酸、戊酸、己酸、辛酸、壬酸、癸酸、十二烷酸、肉豆蘧酸、棕榈酸、硬脂酸和油酸。 In some embodiments, the ester substrate is selected from one or more of the following esters of the acids: formic acid, acetic acid, propionic acid, butyric acid, valeric acid, caproic acid, caprylic acid, nonanoic acid, decanoic acid, dodecanoic acid , myristoyl Qu acid, palmitic acid, stearic acid and oleic acid. 在一些实施方案中，三乙酸甘油酯、三丁酸甘油酯和其他酯充当用于形成过酸的酰基供体。 In some embodiments, triacetin, tributyrin and other esters serve as acyl donors are formed through acid. 在一些实施方案中，酯底物是二乙酸丙二醇酯、二乙酸乙二醇酯或乙酸乙酯。 In some embodiments, the ester substrate is propylene glycol diacetate, ethylene glycol diacetate or ethyl acetate. 在一个实施方案中，酯底物是二乙酸丙二醇酯。 In one embodiment, the ester substrate is propylene glycol diacetate. 如上文所指出，合适的底物可以是单价的（即，包含单个羧酸酯部分）或多价的(即，包含多于一个羧酸酯部分）。  As noted above, a suitable substrate may be monovalent (i.e., containing a single carboxylic acid ester moiety) or multivalent (i.e. containing more than one carboxylate moiety). 可以根据底物分子中羧酸酯部分的数目调节用于颜色修饰的底物的量。 May be adjusted according to the number of substrate molecules in the carboxylic acid ester moieties color modifying amount of substrate used. 在一些实施方案中，羧酸酯部分在水性介质中的浓度是约20-500mM，例如，约40mM至约400mM、约40mM至约200mM或甚至约60mM至约200mM。 In some embodiments, the concentration of the carboxylate moiety in an aqueous medium is about 20-500 mm, e.g., from about 40mM to about 400mM, from about 40mM to about 200mM, or even from about 60mM to about 200mM. 羧酸酯部分的不例性浓度包括约60mM、约80mM、约100mM、约120mM、约140mM、约160mM、约180mM 和约200mM。 Example not part of the carboxylic acids include ester concentration of about 60mM, about 80mM, about 100mM, about 120 mM, about 140 mM, about 160 mM, about 180mM and about 200mM. 在一些实施方案中，在酯底物为二价的情况下（如EGDA的情况下），该底物以约10-200mM,例如，约20mM至约200mM、约20mM至约IOOmM或甚至约30mM至约IOOmM的量提供。  In some embodiments, the case where the substrate is an ester of bivalent (as in the case of EGDA), the substrate is about 10-200 mM, e.g., from about 200 mM to about 20mM, about 20mM or about IOOmM even the amount of about 30mM to about IOOmM provided. 酯底物的示例性量包括约30mM、约40mM、约50mM、约60mM、约70mM、约80mM、约90mM和约100mM。 Exemplary ester substrates comprising an amount of about 30mM, about 40mM, about 50mM, about 60mM, about 70mM, about 80mM, about 90mM and about 100mM. 技术人员可以基于每分子中羧酸酯部分的数目轻易地计算出三价或其他多价酯底物的相应量。 The art based on the number of ester moieties per molecule of carboxylic easily calculate the corresponding amount of trivalent or multivalent other ester substrates. 在一些实施方案中，酯底物以相对于待进行颜色修饰的纺织品上染料的摩尔量而言过量的摩尔提供。  In some embodiments, the ester substrate to be subjected to color textile dyes modified with respect to the terms of the molar amount to provide a molar excess. 在一些实施方案中，酯底物的羧酸酯部分以约20至约20000倍的染料摩尔量提供。 In some embodiments, the carboxylic acid ester moieties of the ester substrate to provide a dye in an amount of from about 20 mole to about 20,000 times. 羧酸酯部分对染料分子的示例性摩尔比是约100/1至约10000/1、约1000/1至约10000/1或甚至2000/1至约6000/1。 An exemplary molar ratio of carboxylate moieties to the dye molecule is from about 100/1 to about 10000/1, about 1000/1 to about 10000/1 or even from about 2000/1 to 6000/1. 在一些情况下，酯底物对染料分子的摩尔比是至少2000/1 或至少6000/1。 In some cases, the molar ratio of the ester substrate is at least dye molecules, or at least 6000/1 2000/1. 在一些实施方案中，在酯底物为二价的情况下（如EGDA的情况下），酯底物以约10至约10000倍的染料摩尔量提供。  In some embodiments, the case where the substrate is an ester of bivalent (as in the case of EGDA), ester substrate to provide a dye in an amount from about 10 mol to about 10,000 times. 酯底物对染料分子的示例性摩尔比是约50/1至约5000/1、约500/1至约5000/1或甚至1000/1至约3000/1。 Exemplary ester molar ratio of Dye substrate molecule is from about 50/1 to about 5000/1, from about 500/1 to about 5000/1 or even from about 3000/1 to 1000/1. 在一些情况下，酯底物对染料分子的摩尔比是至少1000/1或至少3000/1。 In some cases, the molar ratio of the ester substrate is at least dye molecules, or at least 1000/1 3000/1. 如前文，技术人员可以基于每分子中羧酸酯部分的数目轻易地计算出三价或其他多价酯底物的相应量。 As before, the art based on the number of ester moieties per molecule of carboxylic easily calculate the corresponding amount of trivalent or multivalent other ester substrates. 在一些实施方案中，酯底物以约IOOppm至约lOOOOOppm或约2500至约3500ppm的浓度提供。  In some embodiments, the ester substrate to a concentration of about IOOppm lOOOOOppm about 3500ppm, or from about 2500 to about provided. 在一些实施方案中，酯底物以相对于过水解酶而言过量的摩尔提供。 In some embodiments, the ester substrate relative terms to provide a molar excess over the hydrolase. 在一些实施方案中，羧酸酯部分对过水解酶的摩尔比是至少约2X105/1、至少约4X105/1、至少约1X106/1、至少约2X106/1、至少约4X106/1或甚至至少约1X107/1或更大。 In some embodiments, the carboxylic acid ester moieties molar ratio of perhydrolase is at least about 2X105 / 1, at least about 4X105 / 1, at least about 1X106 / 1, at least about 2X106 / 1, at least about 4X106 / 1 or even at least about 1X107 / 1 or greater. 在一些实施方案中，酯底物以相对于过水解酶而言约4X105/1至约4X1071过量的摩尔提供。 In some embodiments, the ester substrate relative to enzyme hydrolysis over about 4X1071 in terms of molar excess of from about 4X105 / 1 provided. 在一些实施方案中，在酯底物为二价的情况下（如EGDA的情况下），酯底物对过水解酶的摩尔比是至少约IX 105/1、至少约2X 105/1、至少约5X 105/1、至少约IX 106/1、至少约2X 106/1或甚至至少约5X 106/1或更大。  In some embodiments, the case where the substrate is an ester of bivalent (as in the case of EGDA), the molar ratio of ester substrate perhydrolase is at least about IX 105/1, at least about 2X 105 / 1, at least about 5X 105/1, at least about IX 106/1, at least about 2X 106/1, or even at least about 5X 106/1 or greater. 在一些实施方案中，酯底物以相对于过水解酶而言约2X105/1至约2X1071过量的摩尔提供。 In some embodiments, the ester substrate relative to enzyme hydrolysis over about 2X1071 in terms of molar excess of from about 2X105 / 1 provided. 技术人员可以基于每分子中羧酸酯部分的数目轻易地计算出三价或其他多价酯底物的相应量。 The art based on the number of ester moieties per molecule of carboxylic easily calculate the corresponding amount of trivalent or multivalent other ester substrates. 过水解酶系统还包括至少一种过氧化氢源。  perhydrolase enzyme system further comprises at least one source of hydrogen peroxide. 通常，可以通过化学、电化学和/或酶促手段直接提供（即，分批地）或连续产生（即，原位）过氧化氢。 Typically, it may be provided directly by a chemical, electrochemical and / or enzymatic means (i.e. batchwise) or continuously generated (i.e., in situ) hydrogen peroxide. 在一些实施方案中，过氧化氢源是过氧化氢本身。  In some embodiments, the hydrogen peroxide source is hydrogen peroxide itself. 在一些实施方案中，过氧化氢源是添加水时产生过氧化氢的化合物。 In some embodiments, the hydrogen peroxide source is hydrogen peroxide is generated through the addition of water. 该化合物可以是固态化合物。 The compound may be a solid compound. 此类化合物包括过氧化氢与多种无机或有机化合物的加合物，其中使用最广泛的所述加合物是碳酸钠过氧化氢合物，也称作过碳酸钠。 Such compounds include adducts of hydrogen peroxide with various inorganic or organic compounds, the most widely used wherein the adduct is sodium carbonate perhydrate, also known as sodium percarbonate. 在一些实施方案中，过氧化氢源是无机过氧化氢合物盐。  In some embodiments, the hydrogen peroxide source is an inorganic perhydrate salt. 无机过氧化氢合物盐的实例是过硼酸盐、过碳酸盐、过磷酸盐、过硫酸盐和过硅酸盐。 Examples of inorganic perhydrate salts are perborates, percarbonates, perphosphates, persulfate and persilicate. 无机过氧化氢合物盐通常是碱金属盐。 The inorganic perhydrate salts are normally the alkali metal salts. 额外的过氧化氢源包括过氧化氢与沸石的加合物或脲过氧化氢。 Additional sources of hydrogen peroxide include urea adduct of hydrogen peroxide or hydrogen peroxide with the zeolite. 过氧化氢源可以是晶体形式和/或基本上纯粹的固体形式，无需额外保护。  a hydrogen peroxide source may be in crystalline form and / or substantially pure form of a solid, without additional protection. 对于某些过氧化氢合物盐，优选的形式是包含包衣的颗粒状组合物，所述包衣为颗粒状产品中的过氧化氢合物盐提供更好的贮藏稳定性。 For perhydrate salt, preferably in the form of a particulate composition comprising certain coated, the coating provides better storage stability for the perhydrate salt in the granular product. 合适的包衣包含无机盐如碱金属硅酸盐、碳酸盐或硼酸盐或其混合物或有机材料如蜡、油或脂肪皂。 Suitable coatings comprise inorganic salts such as alkali metal silicate, carbonate or borate salts or mixtures thereof, or organic materials such as waxes, oils, or fatty soaps. 在一些实施方案中，过氧化氢源是酶促过氧化氢生成系统。  In some embodiments, the hydrogen peroxide source is an enzymatic hydrogen peroxide generating system. 在一个实施方案中，该酶促过氧化氢生成系统包含氧化酶及其底物。 In one embodiment, the enzymatic hydrogen peroxide generating system comprises oxidase and its substrate. 合适的氧化酶包括但不限于：葡萄糖氧化酶、山梨醇氧化酶、己糖氧化酶、胆碱氧化酶、醇氧化酶、甘油氧化酶、胆固醇氧化酶、吡喃糖氧化酶、羧基醇氧化酶、L-氨基酸氧化酶、甘氨酸氧化酶、丙酮酸氧化酶、谷氨酸氧化酶、肌氨酸氧化酶、赖氨酸氧化酶、乳酸氧化酶、香草基氧化酶（vanillyl oxidase)、乙醇酸氧化酶、半乳糖氧化酶、尿酸酶、草酸氧化酶和黄嘌呤氧化酶。 Suitable oxidases include, but are not limited to: glucose oxidase, sorbitol oxidase, hexose oxidase, choline oxidase, alcohol oxidase, glycerol oxidase, cholesterol oxidase, pyranose oxidase, alcohol oxidase carboxy , L- amino acid oxidase, glycine oxidase, pyruvate oxidase, glutamate oxidase, sarcosine oxidase, lysine oxidase, lactate oxidase, vanillyl oxidase (vanillyl oxidase), glycolate oxidase oxidase, galactose oxidase, uricase, oxalate oxidase and xanthine oxidase. 以下方程提供用于酶促生成过氧化氢的偶联系统的实例。  The following equations are provided for generating enzymatic Examples of coupling system through the hydrogen peroxide. 不意图使H2O2的生成限于任何特定的酶，因为可以使用以合适底物生成H2O2的任意酶。  is not intended that the H2O2 generated limited to any specific enzyme, as may be used in any suitable substrate generating enzyme of H2O2. 例如，来自已知从乳酸和氧产生H2O2的乳杆菌属（Lactobacillus)物种中的乳酸氧化酶。 For example, H2O2 generated from a known Lactobacillus (Lactobacillus) species of lactic acid from the lactate oxidase and oxygen. 这种反应的一个优势是酸（例如，上文实例中的葡萄糖酸）的酶促生成，这降低碱性水溶液的pH至其中过酸最有效漂白的pH范围内（即，处于或低于pKa)。 One advantage of this reaction are an acid (e.g., gluconic acid in the above example) enzymatic generation, which reduces the pH to the alkaline aqueous solution wherein the peracid bleach most effective pH range (i.e., at or below the pKa ). 这种的pH降低也直接因过酸产生而引起。 This is also a direct result of the pH reduction caused by peracid generated. 能够生成过氧化氢的其他酶（例如，醇氧化酶、乙二醇氧化酶、甘油氧化酶、氨基酸氧化酶等）也可以与过水解酶组合使用酯底物以生成过酸。 Capable of generating hydrogen peroxide, other enzymes (e.g., alcohol oxidase, ethylene glycol oxidase, glycerol oxidase, amino acid oxidase, etc.) may be used in combination with the perhydrolase enzymes ester substrate to form a peracid. 在电化学地生成过氧化氢的情况下，可以例如使用供给氧和氢气的燃料电池产生过氧化氢。 In the case  generation of hydrogen peroxide in an electrochemical manner, generation of hydrogen peroxide may be used, for example, the supply of oxygen and hydrogen fuel cells. 1000倍的染料摩尔量提供。 1000-fold molar amount of dye provided. 在一些实施方案中，过氧化氢以约10-200mM，例如，约20mM至约200mM、约20mM至约IOOmM或甚至约30mM至约IOOmM的量提供。  In some embodiments, hydrogen peroxide is about 10-200 mM, e.g., from about 20mM to about 200 mM, from about 20mM to about 30mM or even about IOOmM an amount to provide about IOOmM. 过氧化氢的示例性量包括约30mM、约40mM、约50mM、约60mM、约70mM、约80mM、约90mM 和约100mM。 An exemplary amount of hydrogen peroxide include about 30mM, about 40mM, about 50mM, about 60mM, about 70mM, about 80mM, about 90mM and about 100mM. 在一些实施方案中，过氧化氢以相对于染料的摩尔量而言过量的摩尔提供，以进行颜色修饰。  In some embodiments, the hydrogen peroxide relative to the molar amount of dye is provided in terms of a molar excess, for color modification. 在一些实施方案中，过氧化氢以约10至约10000倍的染料摩尔量提供。 In some embodiments, hydrogen peroxide is provided in an amount from about 10 mole dye to about 10,000 times. 过氧化氢对染料分子的示例性摩尔比是约500/1至约5000/1或甚至1000/1至约3000/1。 Exemplary molar ratio of hydrogen peroxide on the dye molecule is from about 500/1 to about 5000/1 or even from about 3000/1 to 1000/1. 在一些情况下，过氧化氢对染料分子的摩尔比是至少1000/1或至少3000/1。 In some cases, the molar ratio of hydrogen peroxide through the dye molecule is at least, or at least 1000/1 3000/1. 在一些实施方案中，过氧化氢以相对于过水解酶而言过量的摩尔提供。  In some embodiments, the hydrogen peroxide relative terms to provide a molar excess over the hydrolase. 在一些实施方案中，过氧化氢对过水解酶的摩尔比是至少约1Χ105Λ、至少约2X105/1、至少约5X105/1、至少约1X106/1、至少约2X106/1或甚至至少约5X106/1或更大。 In some embodiments, hydrogen peroxide molar ratio of perhydrolase is at least about 1Χ105Λ, at least about 2X105 / 1, at least about 5X105 / 1, at least about 1X106 / 1, at least about 2X106 / 1 or even at least about 5X106 / 1 or greater. 在一些实施方案中，过氧化氢以相对于过水解酶而言约2X105/1至2X1071过量的摩尔提供。 In some embodiments, hydrogen peroxide is too relative terms perhydrolase molar excess of about 2X1071 to 2X105 / 1 provided. 在一些情况下可能希望添加过氧化氢酶至纺织品浴液以破坏残留的过氧化氢。  In some cases it may be desirable to add catalase to destroy residual textile bath of hydrogen peroxide. 在此类情况下，过氧化氢酶通常可以直接添加至该浴液，无需之前淋洗该纺织品。 In such cases, generally catalase can be added directly to the bath without prior rinsing the textile. 在一些实施方案中，所述组合物和方法包括用漆酶或相关的酶系统处理以实现纺织品的色光、颜色或深浅变化。  In some embodiments, the compositions and methods include treatment with a laccase or a related enzyme system to effect color light, a color or shade change textiles. 漆酶系统可以与过水解酶处理依次地使用。 Laccase system may be treated sequentially perhydrolase enzyme used. 另外，漆酶系统可以在过水解酶系统之前或之后使用以产生广泛类型的修整和颜色。 Further, laccase system can be used before or after the perhydrolase enzyme system to produce a wide variety of colors and trim. 漆酶和漆酶相关的酶包括分类EC I. 10. 3. 2的酶。  Laccase and laccase related enzymes include enzyme classification EC I. of 10. 3.2. 已知漆酶来自微生物和植物来源。 Laccase derived from known microorganisms and plant sources. 微生物漆酶可以从细菌或真菌（包括丝状真菌和酵母）衍生并且合适的实例包括从曲霉属、脉孢霉属（Neurospora),例如，粗糙脉孢霉（N. crassa)、柄孢壳属(Podospora)、葡萄孢属(Botrytis)、金钱菌属（Collybia)、下皮黑孔菌属（Cerrena),例如，单色下皮黑孔菌（Cerrenaunicolor)、葡萄穗霉属（Stachybotrys)、革耳属（Panus),例如，野生革耳（Panus rudis)、梭孢壳属（Theilava)、层孔菌属（Fomes)、香苑属(Lentinus)、侧耳属（Pleurotus)、栓菌属（Trametes),例如绒毛栓菌(T. villosa)和变色栓菌（T. versicolor)、丝核菌属（Rhizoctonia),例如，立枯丝核菌(R. solani);鬼伞属（Coprinus),例如裙纹鬼伞（C. plicatilis)和灰盖鬼伞（C. cinereus)、小脆柄燕属(Psatyrella)、毁丝霉属（Myceliophthora),例如，嗜热毁丝霉（M. thermonhila)、柱顶抱属（Schytalidium)、射脉菌属（Phlebia)，例如，射脉菌(P. radita) (WO 92/01046);或革盖菌属 Microbial laccase may be derived from bacteria or fungi (including filamentous fungi and yeasts) and suitable examples thereof include the genus Aspergillus, the genus Neurospora (Neurospora), e.g., Neurospora crassa (N. crassa), Podospora handle Fusarium (Podospora), botrytis (Botrytis-), the genus money (Collybia), subcutaneous black hole genus (Cerrena), e.g., the monochrome black skin volvatus (Cerrenaunicolor), Stachybotrys (of Stachybotrys), leather ear genus (Panus), e.g., wild leather ear (Panus rudis), Thielavia (Theilava), Fomes (Fomes), Xiangyuan genus (Lentinus), Pleurotus (of Pleurotus), Trametes (Trametes ), for example, fluff Trametes (T. villosa), and Trametes versicolor (T. versicolor), Rhizoctonia (, Rhizoctonia), e.g., Rhizoctonia solani (R. solani); Coprinus (Chrysosporium, Coprinus), e.g. Coprinus skirt profile (C. plicatilis), and Coprinus cinereus (C. cinereus), small brittle stem hirundo (Psatyrella), Myceliophthora (Myceliophthora), e.g., Myceliophthora thermophila (M. thermonhila), capitals hold genus (Schytalidium), the genus shot pulse (Phlebia), e.g., shot pulse bacteria (P. radita) (WO 92/01046); or the genus Coriolus （Coriolus),例如，毛革盖菌(C. hirsutus) (JP 2—238885)、棉皮孔菌属中的种(Spongipellis sp·)、多孑L 菌属（Polyporus)、虫拟腊菌（Ceriporiopsissubvermispora)、粗皮灵芝（Ganoderma tsunodae)和木霉属（Trichoderma)菌株可衍生的漆酶。 (Coriolus), e.g., wool versicolor (C. hirsutus) (JP 2-238885), genus lenticels cotton species (Spongipellis sp ·), multiple species larvae L (of Polyporus), insect wax intends bacteria ( Ceriporiopsissubvermispora), bark Ganoderma (Ganoderma tsunodae) and Trichoderma (Trichoderma) strain laccase derivable. 可以通过以下方式产生漆酶或漆酶相关酶，即在允许漆酶表达的条件下在培养基中培养用重组DNA载体转化的宿主细胞，并从培养物中回收漆酶，其中所述重组DNA载体包含编码所述漆酶的DNA序列以及允许编码漆酶的DNA序列表达的DNA序列。  may produce laccase or laccase-related enzymes in the following manner, i.e., that allow culturing a host cell transformed with a recombinant DNA vector in a culture medium under conditions that the expression of laccase, and recovering the laccase from the culture, wherein said recombinant DNA vector comprising a DNA encoding the laccase DNA sequence and sequences to allow expression of the DNA sequence encoding the laccase. 含有编码漆酶的多核苷酸序列的表达载体可以转化入合适的宿主细胞中。  expression vector containing a polynucleotide sequence encoding a laccase can be transformed into a suitable host cell. 宿主细胞可以是真菌细胞，如丝状真菌细胞，所述真菌细胞包括但不限于木霉属物种（例如，里氏木霉（先前分类为长枝木霉（T. Iongibrachiatum. )并且目前也称作红褐肉座菌(Hypocrea jecorina))、绿色木霉(Trichoderma viride)、康氏木霉(Trichodermakoningii)、哈茨木霉(Trichoderma harzianum)；曲霉属某些物种（例如，黑曲霉(Aspergillusniger)、构巢曲霉(Aspergillus nidulans)、米曲霉(Aspergillus oryzae)、泡盛曲霉（Aspergillus awamori))、青霉属（Penicillium)某些物种、腐质霉属某些物种（例如，Humicola insolens、灰腐质霉（Humicola grisea))、镰孢霉属某些物种（例如禾谷镰孢（Fusarium graminum)、有毒镰孢（Fusariumvenenatum))、脉孢霉属某些物种(Neurospora spp. )、肉座菌属某些物种（Hypocrea spp. )和毛霉属物种（Mucor spp. )。用于表达漆酶的宿主细胞也可以是下皮黑孔菌属物种（例如，单色下皮黑孔菌）的细胞。 The host cell may be a fungal cells such as filamentous fungal cell, the fungal cells include, but are not limited to Trichoderma species (e.g., Trichoderma reesei (previously classified as Trichoderma (T. Iongibrachiatum.) And is also known as as jecorina (Hypocrea jecorina)), green Trichoderma (Trichoderma viride), Trichoderma (Trichodermakoningii), Trichoderma harzianum (Trichoderma harzianum); Aspergillus spp (for example, Aspergillus niger (Aspergillusniger), nidulans (Aspergillus nidulans), Aspergillus (Aspergillus oryzae), Aspergillus awamori (Aspergillus awamori)), some species of Penicillium (Penicillium), Humicola spp. (e.g., Humicola insolens, Humicola (Humicola grisea)), Fusarium spp (e.g. F. graminearum (Fusarium graminum), Fusarium venenatum (Fusariumvenenatum)), Neurospora spp. (Neurospora spp. ), a Hyprocrea these species (Hypocrea spp.) and Mucor species (Mucor spp.). the host cell for expression of laccase may also be a black hole subcutaneous spp (e.g., the monochrome black volvatus skin) cells. 真菌细胞可以通过涉及原生质体形成和原生质体转化，随后使用本领域已知的技术再生细胞壁的方法进行转化。备选地，宿主生物可以是细菌，如芽孢杆菌属某些物种（例如，枯草芽抱杆菌、地衣芽抱杆菌（Bacilluslicheniformis)、迟缓芽抱杆菌（Bacillus lentus)、嗜热脂肪芽抱杆菌（Bacillus stearothremophilus)、短芽抱杆菌（Bacillus brevis))、假单胞菌属（Pseudomonas)、链霉菌属（Streptomyces)(例如，天蓝色链霉菌（Streptomycescoelicolor)、变铅青链霉菌（Streptomyces Iividans))或大肠杆菌（E. coli)。细菌细胞的转化可以例如根据如T. Maniatis 等人，MolecularCloning ：A Laboratory Manual, 1982中所述的常规方法进行。筛选适宜的DNA序列和载体构建也可以通过标准方法实施。 Fungal cells may be by a process involving protoplast formation and transformation of the protoplasts, followed by art-known methods in the art of reproducing the cell wall for transformation. Alternatively, the host organisms may be a bacterium, such as Bacillus spp. (E.g., B. sprouts hold Bacillus licheniformis, Bacillus spores (Bacilluslicheniformis), slow Bacillus spores (Bacillus lentus), Bacillus stearothermophilus spores (Bacillus stearothremophilus), short bacillus spores (Bacillus brevis)), Pseudomonas (of Pseudomonas), Streptomyces (of Streptomyces) (e.g., Streptomyces coelicolor (Streptomycescoelicolor), becomes Streptomyces lividans (Streptomyces Iividans)) or Escherichia coli (E. coli). the transformation of bacterial cells may be such as, for example, according to T. Maniatis et al., MolecularCloning: a Laboratory Manual, 1982 according to a conventional method in screening appropriate DNA sequences and vectors constructed by standard methods may also be implemented. 用来培养已转化宿主细胞的培养基可以是适于培育所述宿主细胞的任何常规培养基。  medium used to culture the transformed host cells may be any conventional medium suitable for growing the host cells. 在一些实施方案中，表达的酶分泌至培养基中并且可以从中通过本领域熟知的方法回收。 In some embodiments, expression of the enzyme secreted into the medium and may be recovered therefrom by methods known in the art. 例如，漆酶可以从培养基中如美国公开号2008/0196173中所述那样回收。 For example, laccase can be prepared as described in U.S. Publication No. 2008/0196173 as recovered from the medium. 在一些实施方案中，该酶以胞内方式表达并且在破坏细胞膜后回收。 In some embodiments, the enzyme is expressed intracellularly and recovered in the manner disrupt cell membranes. 在一个实施方案中，表达宿主可以是里氏木霉，其带有在CBHl启动子控制下的漆酶编码区和终止子。  In one embodiment, the expression host can be Trichoderma reesei, which has laccase coding region, and terminator under control of a promoter CBHl. （见，例如美国专利号5，861，271)。 (See, eg, US Patent No. 5,861,271). 表达载体可以是pTrex3g，如美国专利号7，413，887中所公开。 The expression vector may be pTrex3g, as described in U.S. Patent No. 7,413,887 disclosed. 在一些实施方案中，漆酶如美国公开号2008/0196173或美国系列号12/261,306中所述那样表达。  In some embodiments, the laccase as described in US Publication No. 2008/0196173 or U.S. Serial No. 12 as the expression / 261,306. 在一些实施方案中，漆酶与SEQ ID NO :4中所述的氨基酸序列至少约70%、75%、 80%、85%、90%、91%、92%、93%、94%、95%、96%、97%、98%、99%或甚至99. 5% 同一。  In some embodiments, the laccase and SEQ ID NO: 4 in the amino acid sequence of at least about 70%, 75%, 80%, 85%, 90%, 91%, 92%, 93%, 94 %, 95%, 96%, 97%, 98%, 99% or even 99.5% identical. 合适的漆酶系统可以包括增强漆酶活性的化学介质剂。  Suitable laccases system may include an enhanced activity of a chemical agent paint medium. 此类介质充当氧还介质以有效地使电子往返于显示氧化酶活性的酶与染料、颜料（例如，靛蓝）、发色团（例如，多酚类、花青苷或类胡萝卜素，例如，在有色污溃中)或其他次级底物或电子供体之间。 Such media serving as the redox medium effective to the electronic display and from an enzyme with oxidase activity dyes, pigments (e.g., indigo), chromophores (e.g., polyphenols, carotenoids, anthocyanins, or, for example, in the colored sewage collapse) or other substrates or secondary electron between the donor. 化学介质还称作强化剂和加速剂。 Fortifiers and chemical mediators also known accelerators. 介质可以是酚化合物，例如，丁香酸甲酯和相关化合物，如PCT申请号W095/01426和TO96/12845所述那样。  medium may be a phenol compound, e.g., methylsyringate and related compounds, such as the PCT Application No. W095 / 01426 and TO96 / 12845 above. 化学介质还可以是N-羟基化合物、N-肟化合物或N-氧化化合物，例如，N-羟基苯并三唑、紫尿酸或N-羟基乙酰苯胺。 N- chemical media may also be a hydroxy compound, an oxime compound N- or N- oxide compounds, e.g., N- hydroxybenzotriazole, violuric acid or N- hydroxyacetanilide. 化学介质还可以是酚5恶嗪/吩噻嗪化合物，例如吩噻嗪-10-丙酸酯。 Chemical mediator may also be a phenolic oxazine-5 / phenothiazine compounds, e.g. phenothiazin-10-propionate. 化学介质还可以是2，2' -连氮基双-(3-乙基苯并噻唑啉-6-磺酸）（ABTS)。 Chemical mediator may also be 2,2 '- azino bis - (3-ethyl benzo thiazoline-6-sulfonic acid) (ABTS). 其他化学介质是本领域熟知的。 Other chemical mediators are well known in the art. 例如，已知PCT申请号W095/01426中公开的化合物增强漆酶的活性。 For example, a compound known to PCT Application No. W095 / 01426 disclosed enhance the activity of laccase. 在一些实施方案中，介质可以是乙酰丁香酮、丁香酸甲酯、丁香酸乙酯、丁香酸丙酯、丁香酸丁酯、丁香酸己酯或丁香酸辛酯。 In some embodiments, the medium may be acetosyringone, methylsyringate, ethyl clove, eugenol, propyl, butyl syringic acid, syringic acid hexyl ester, octyl or cloves. 4- [N- (2-羟乙基）甲酰胺基]-2，6- 二甲氧基苯酚或4- (N，N- 二甲基甲酰胺基）-2，6- 二甲氧基苯酚。 4- [N- (2- hydroxyethyl) carboxamido] -2,6-dimethoxy-phenol or 4- (N, N- dimethyl-carboxamido) -2,6-dimethoxy phenol. 在一些实施方案中，上文所提及式中的A是-CN或-C0-E，其中E可以是-H、-OH、-R、-OR或-NXY，其中X和Y可以相同或不同并且选自-H、-OH、-OR和-R, R是C1-C16烷基，优选C1-C8烷基，所述烷基可以是饱和或不饱和的、分支或不分支的并且任选地被羧基、磺基或氨基取代；并且B和C可以相同或不同并且选自Cm H2ffl+1；l^m^50在一个实施方案中，介质是4-羟基-3，5- 二甲氧基苄腈（本文中又互换地命名为“丁香腈”或“SN”）。  In some embodiments, the above-mentioned formula, A is -CN or -C0-E, in which E may be -H, -OH, -R, -OR, or -NXY, wherein X and Y may be the same or different and are selected from -H, -OH, -OR and -R, R is C1-C16 alkyl, preferably C1-C8 alkyl group which may be saturated or unsaturated, branched or unbranched and optionally substituted with a carboxyl group, a sulfo group or a substituted amino group; and B and C may be the same or different and are selected from Cm H2ffl + 1; l 50] in one embodiment ^ ^ m, the medium is 4-hydroxy-3,5 - dimethoxybenzonitrile (interchangeably herein and named "clove nitrile" or "SN"). 如所示，A可以相对于羟基置于间位而非置于对位中。 As shown, A may be placed meta to the hydroxyl group and not placed in the para position. 对于纺织加工应用，介质可以每克纺织品（例如粗斜纹棉布）约O. 005至约1000微摩尔、每克纺织品约O. 05至约500微摩尔、每克纺织品约O. I至约100微摩尔、每克纺织品约I至约50微摩尔或每克纺织品约2至约20微摩尔的浓度存在。  for textile processing applications, textile medium may be per gram (e.g. denim) from about O. 005 to about 1000 micromoles per gram of textile from about O. 05 to about 500 micromoles per gram of from about O. I to textiles about 100 micromoles per gram of textile present from about I to micromolar concentration per gram of textile micromolar or from about 2 to about 20 to about 50. 介质可以通过技术人员已知的方法（例如PCT申请号W097/11217和WO 96/12845和美国专利号5，752，980中公开的那些方法）制备。  medium may be (PCT Application No. W097 / 11217 and WO 96/12845 and those described in U.S. Patent No. 5,752,980, for example, disclosed in) are prepared by methods known to skilled person. 用于本文中的合适介质例如在美国公开号2008/0189871中描述。 Suitable media described herein, for example, in U.S. Publication No. 2008/0189871 of. 用于磨蚀和颜色修饰的本发明组合物和方法可以与酶促退浆过程组合地使用。 Compositions and methods of the present invention  for abrasion and color modification process may be used in combination with an enzymatic desizing. 退浆一般在磨蚀之前和颜色修饰之前进行。 Desizing is generally carried out before and color modifications before abrasion. 可以使用一种或多种退浆酶。 Possible to use one or more desizing enzyme. 在一些实施方案中，退浆酶是淀粉分解酶，如α-淀粉酶、淀粉酶、甘露聚糖酶、葡糖淀粉酶或其组合。  In some embodiments, the desizing enzyme is an amylolytic enzyme, such as α- amylases, amylases, mannanases, glucoamylase, or combinations thereof. 合适的α和淀粉酶包括细菌或真菌来源的那些淀粉酶，以及此类淀粉酶的化学或基因修饰的突变体和变体。  Suitable amylases include α and bacterial or fungal origin amylases, and chemically or genetically modified mutants of such amylases and variants thereof. 合适的α-淀粉酶包括可芽孢杆菌属物种可获得的α-淀粉酶。 Suitable α- amylases include the Bacillus α- amylases species available. 合适的商业淀粉酶包括但不限于OPTISIZE®40、OPTISIZE® 160、OPTISIZE® HT 260、OPTISIZE® HT520、OPTISIZE® ht Plus、OPTISIZE®FLEX (均来自Genencor)和DURAMYL™、TERMAMYL™、FUNGAMYL™ 和BAN™(均可从NovozymesA/S, Bagsvaerd,丹麦获得）。 Suitable commercial amylases include but are not limited to OPTISIZE®40, OPTISIZE® 160, OPTISIZE® HT 260, OPTISIZE® HT520, OPTISIZE® ht Plus, OPTISIZE®FLEX (all from Genencor) and DURAMYL ™, TERMAMYL ™, FUNGAMYL ™ and BAN ™ (all available from NovozymesA / S, Bagsvaerd, Denmark). 其他合适的淀粉分解酶包括CGT酶（环糊精葡聚糖转移酶，EC 2. 4. I. 19),例如，从芽孢杆菌属、热厌氧杆菌属（Thermoanaerobactor)或热厌氧杆细菌（Thermoanaero-bacterium)的物种获得的那些CGT酶。 Other suitable amylolytic enzymes include CGT enzyme (cyclodextrin glucanotransferase, EC 2. 4. I. 19), e.g., from the genus Bacillus, the genus Thermoanaerobacter (Thermoanaerobactor) or hot rods anaerobic bacteria those CGT enzyme (Thermoanaero-bacterium) species available. OPTISIZE® 40 和OPTISIZE® 160 的活性以RAU/g 产品表述。  OPTISIZE® 40 and OPTISIZE® activity at 160 RAU / g product expression. 一个RAU是在标准条件下在I小时内转化I克淀粉成可溶性糖的酶量。 A RAU is converted under standard conditions within I h I g starch into soluble sugars in the amount of enzyme. OPTISIZE®HT 260、OPTISIZE® HT 520 和OPTISIZE® HT Plus 的活性以TTAU/g 表述。 OPTISIZE®HT 260, OPTISIZE® HT 520 and OPTISIZE® HT Plus activity expressed in TTAU / g. 一个TTAU 是标准条件下每小时水解IOOmg淀粉成可溶性糖所需要的酶量。 A TTAU is hydrolyzed under standard conditions per hour IOOmg amylase enzyme as the amount of soluble sugars needed. OPTISIZE® FLEX的活性以TSAU/g确定。 OPTISIZE® FLEX activity determined TSAU / g. 一个TSAU是标准条件下在I分钟内转化Img淀粉成可溶性糖所需的酶量。 A is the amount of enzyme required TSAU soluble sugars converted under standard conditions to Img of starch within I minute. 退浆酶可以从其中已经添加、缺失或替换一个或多个氨基酸的上文所列酶衍生，包括杂合多肽，只要所得的多肽显示退浆活性即可。  Desizing wherein the enzyme may have been added, deleted or replaced enzymes listed above, one or more amino derivatives, including hybrid polypeptides, as long as the resulting polypeptide exhibits an activity to desizing. 在实施本发明中有用的此类变体可以使用常规诱变方法产生并且使用例如高通量筛选技术如琼脂平板筛选法进行鉴定。 Such variants may be useful to use conventional mutagenesis generated and identified using a method such as high-throughput screening techniques such as the agar plate screening method in the embodiment of the present invention. 将退浆酶以有效使纺织材料退浆的量添加至水溶液（S卩，处理组合物）。  The amount effective to desizing enzyme desizing textile material added to an aqueous solution of (S Jie, treatment composition). 一般而言，退浆酶如α-淀粉酶按照以织物重量计约0.00001%至约2%酶蛋白的量、优选按照以织物重量计约0. 0001%至约1%酶蛋白的量、更优选按照以织物重量计约0. 001%至约0. 5%酶蛋白的量并且甚至更优选按照以织物重量计约0. 01%至约0. 2%酶蛋白的量掺入处理组合物中。 Typically, desizing enzymes, such as α- amylase in weight of the fabric in an amount from about 0.00001% to about 2% of enzyme protein by weight of the fabric in an amount from about 0.0001% to about 1% of enzyme protein preferably, more preferably the fabric in an amount from about 0.001% to about 0.5% enzyme protein and even more preferably in an amount in weight of the fabric from about 0.01% to about 0.2% enzyme protein by treatment composition incorporated in. 在一些实施方案中，过氧化氢酶可以用来催化在纺织加工的任意阶段时残余过氧化氢的分解。  In some embodiments, the catalase can be used to catalyze the decomposition of hydrogen peroxide residual at any stage of textile processing. 过氧化氢酶例行地用于“漂白清洁”，所述的漂白清洁广义地指破坏用来在染色之前漂白（即，增白和亮化）纺织品的残余过氧化氢。 Catalase routinely used for "bleach clean", the bleach cleaning broadly refers to destruction before dyeing bleaching (i.e., lighting and whitening) of the textile residual hydrogen peroxide. 过氧化氢酶还例行地用于破坏过氧化氢，其中所述的过氧化氢用来使水质染色液中存在的残留染料脱色。 Catalase is also routinely used to destroy hydrogen peroxide, wherein the hydrogen peroxide is used for bleaching the residual dye stain solution present in the water quality. 过氧化氢酶也可以用来破坏来自过水解酶系统的残余过氧化氢。 Catalase may be used to destroy residual hydrogen peroxide from a perhydrolase enzyme system. 用于漂白清洁和用于破坏来自过水解酶系统中残余过氧化氢的过氧化氢酶可以直接添加至浴液，无需淋洗。 Used for bleaching and cleaning from perhydrolase for destroying residual hydrogen peroxide system of the catalase can be added directly to the bath without rinsing. 示例性过氧化氢酶是从Genencor可获得的过氧化氢酶Τ100和OXY- GONE®T400 和从Novozymes 可获得的CATAZYME®或TERMINOX® ultra。  Exemplary catalase is obtainable from Genencor catalase Τ100 and OXY- GONE®T400 and available from Novozymes CATAZYME® or TERMINOX® ultra. 示例性过氧化氢酶在欧洲专利号EP O 629 134中描述。 Exemplary catalase described in European Patent No. EP O 629 134. 将理解一种或多种纤维素酶、过水解酶、漆酶、淀粉酶、甘露聚糖酶、过氧化氢酶或本文中提到的其他酶可以在本发明的组合物和方法中使用。  It will be appreciated, one or more cellulases, perhydrolases, laccase, amylases, mannanases, catalase or other enzymes may be referred to herein compositions and methods of the present invention use. 另外，任意数目的额外酶（或酶系统）可以与本发明的组合物和方法组合，而不否定本公开的精神。 In addition, any number of additional enzyme (or enzyme system) may be combined and compositions and methods of this invention, without the negative spirit of the present disclosure. 示例的额外酶包括但是不限于果胶裂解酶类、果胶酶类、木聚糖酶类、聚酯酶类和已经描述和/或用于纺织加工的其他酶。 Additional examples of enzymes include, but are not limited to pectate lyase enzymes, pectinases, xylanases, enzymes and polyesters have been described and / or other enzymes used in textile processing. 在一些方面，本发明的组合物和方法涉及在相同浴液中使用与过水解酶系统组合的纤维素酶的酶促纺织品磨蚀和颜色修饰，无需在酶促处理之间洗涤或淋洗纺织品。  In some aspects, the compositions and methods of the present invention relates to the use of color through enzymatic textile modified cellulase abrasion and hydrolytic enzyme system are combined in the same bath, without washing between enzymatic treatment or leaching wash textiles. 磨蚀和颜色修饰可以依次或同时地进行。 Abrasion and color modifications can be carried out sequentially or simultaneously. 磨蚀可以在颜色修饰之前或之后进行。 Abrasion can be performed before or after the color modification. 出于制造靛蓝或硫化染料染色粗斜纹棉布产品的目的，使用纤维素酶的磨蚀过程（例如，酶促“石磨洗”）一般在使用过水解酶系统的颜色修饰之前进行。 For the purpose of producing indigo or the sulfur dyed denim products, cellulase abrasion process (e.g., enzymatic "stonewashing") is generally used for color modification prior to hydrolyzing enzyme system. 在其他实施方案中，本发明的组合物和方法涉及使用与过水解酶系统和漆酶系统组合的纤维素酶的酶促纺织品磨蚀和颜色修饰。  In other embodiments, the compositions and methods of the present invention involves the use of cellulose perhydrolase enzyme system combined system and laccase enzyme enzymatic abrasion and color modifying textiles. 如本文中所述，使用纤维素酶的磨蚀和使用过水解酶系统的颜色修饰可以在相同浴液中依次或同时地进行。 As described herein, the use of cellulase abrasion and use of perhydrolase enzyme system color modifications can be performed sequentially or simultaneously in the same bath. 如W02010075402中所述，使用纤维素酶的磨蚀和使用漆酶系统的颜色修饰也可以在相同浴液中依次或同时地进行。 As described in W02010075402, abrasion cellulase and laccase using color modification system may be performed sequentially or simultaneously in the same bath. 然而，还已经发现以二者顺序中任一顺序依次使用过水解酶系统和漆酶系统允许纺织品制造商仅使用有限的成套酶系统产生大批不同的纺织品修整和颜色。 However, it has also been found in both sequence sequentially in either order using the perhydrolase enzyme system and laccase systems allow a large number of textile manufacturers produce various textile finishing and color using only a limited sets of enzyme systems. 在图1-5中所示的表中列出了使用本发明组合物和方法的多种实施方案可以获得的靛蓝染色粗斜纹棉布的示例性修整和颜色。  An exemplary list and trim color using the compositions and methods of the present invention can be obtained in various embodiments of indigo-dyed denim in the table shown in Figures 1-5. 用来获得所示效果的示例性纤维素酶是MEX-500 ;然而，如所附的实施例中描述，可以使用其他酸性和中性纤维素酶，伴有相似的结果。 Exemplary cellulases are used to obtain the results shown in MEX-500; however, as the following described embodiments, other acidic and neutral cellulases, with similar results. 在具体的实施方案中，硫化染料染色的纺织品可以被加工以赋予灰色光而不产生棕色色泽。 In a specific embodiment, the sulfur dye dyeing of textiles may be processed to impart a brown color without generating light gray. 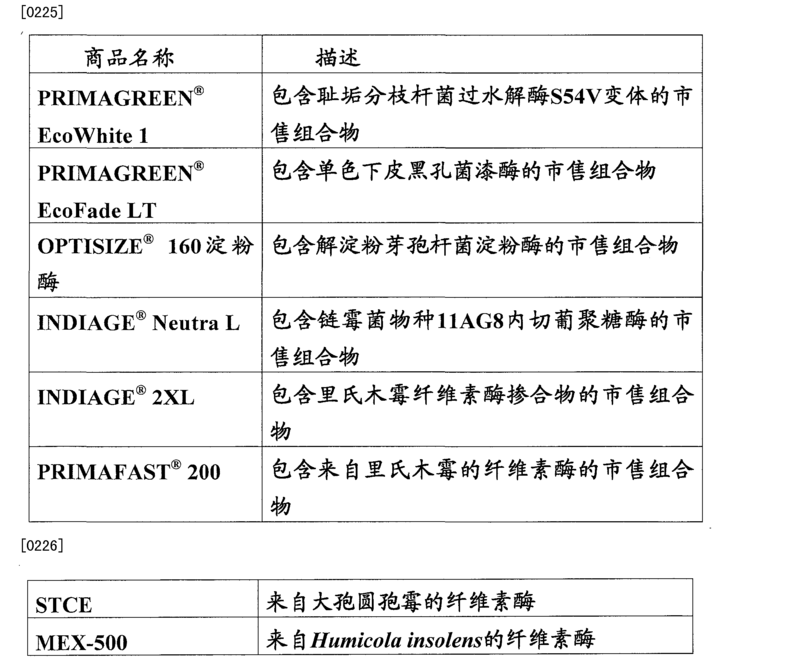 示例性过水解酶和漆酶系统分别是PRIMAGREEN® EcoWhite I和PRIMAGREEN® EcoFade LT，不过这些示例性系统也是非限制性的。 Exemplary perhydrolase enzyme and laccase systems are PRIMAGREEN® EcoWhite I and PRIMAGREEN® EcoFade LT, but the examples are non-limiting exemplary system. 用每种示例性工艺获得的具体修整和颜色比下述事实较不重要，所述事实是使用有限数目的适用于单浴组合中的酶促工艺可以获得大批不同的效果。 DETAILED trimming and the color obtained by each of the exemplary process less important than the fact that, the fact is applicable to a limited number of different effects can be obtained in a large number of enzymatic processes in a single bath composition. 虽然主要使用靛蓝和硫化染料染色的纺织品举例，但是本发明的方法可以用于用许多染料染色的颜色修饰纺织品。  Although primarily indigo and sulfur dye dyeing textiles example, the method of the present invention can be used with many colors of dyed textile modification. 染料的实例包括，但不限于偶氮染料、单偶氮染料、双偶氮染料、硝基染料、咕吨染料、喹啉染料、蒽醌染料、三芳基甲烷染料、对偶氮苯胺染料、吖嗪染料、13恶嗪染料、芪染料、苯胺染料和酞菁染料或其混合物。 Examples of dyes include, but are not limited to, azo dyes, monoazo dyes, disazo dyes, nitro dyes, xanthene dyes, quinoline dyes, anthraquinone dyes, triarylmethane dyes, aniline azo dyes, azine dye, 13 oxazine dyes, stilbene dyes, aniline dyes, and phthalocyanine dyes or mixtures thereof. 在一个实施方案中，染料是偶氮染料（例如，活性黑5 (2，7-萘二磺酸，4-氨基-5-羟基-3，6-双（(4-((2-(磺基氧基）乙基）磺酰）苯基）偶氮）_四钠盐）、活性紫5、甲基黄、刚果红）。 In one embodiment, the dyes are azo dyes (e.g., Reactive Black 5 (2,7-naphthalene dicarboxylic acid, 4-amino-5-hydroxy-3,6-bis ((4 - ((2- (sulfo yloxy) ethyl) sulfonyl) phenyl) azo) tetrasodium salt _), reactive violet 5, methyl yellow, congo red). 在一些实施方案中，染料是蒽醌染料（例如，雷玛唑蓝（remazolblue))、靛蓝（靛蓝胭脂红）、三芳基甲烷/对偶氮苯胺染料（例如，结晶紫、孔雀石绿）或基于硫的染料。 In some embodiments, the dyes are anthraquinone dyes (e.g., Remazol Blue (remazolblue)), Indigo (Indigo Carmine), triarylmethane / azo aniline dyes (e.g., crystal violet, malachite green) or on sulfur dyes. 在多种实施方案中，染料是活性染料、直接染料、分散染料或色素染料。 In various embodiments, the dyes are reactive dyes, direct dyes, disperse dyes or pigments. 在一些实施方案中，染料是油墨的组分。 In some embodiments, the dye is a component of the ink. 酶促方式使用下可以被氧化性颜色修饰的一类染料是活性染料。 Can be modified using the oxidative color  enzymatically reactive dye is a dye. 活性染料是包含活化或可活化官能团的发色团，其中所述的官能团能够化学地与待染色的目的表面如纺织品表面相互作用。 Activated reactive dye containing chromophores or activatable functional group, wherein said functional group capable of chemically with the surface of the object to be dyed textiles such as surface interactions. 这种相互作用可以采取共价键的形式。 Such interaction may take the form of a covalent bond. 示例性官能团包括一氯三嗪、一氟氯三嗪、二氯三嗪、二氟氯嘧啶、二氯喹喔啉、三氯嘧啶、乙烯基酰胺、乙烯基砜等。 Exemplary functional groups include a chlorine-triazine, a CFC-triazine, dichloro triazine, pyrimidine difluorochloromethyl, dichloro quinoxaline, trichloropyrimidine, vinyl amide, vinyl sulfone. 活性染料可以具有多于一个官能团（例如，双官能活性染料），因而能够更高程度地与织物固定。 Reactive dye may have more than one functional group (e.g., a difunctional reactive dye), it is possible to a higher degree is fixed to the fabric. 与酶促退浆和使用酶（如过氧化氢酶）的酶促漂白清洁组合时，本发明的组合物和方法代表完整的酶促纺织加工解决方案，所述解决方案允许纺织品制造商仅使用有限数目的酶系统产生具有一系列不同修整和颜色的纺织产品。  with enzymatic desizing and when using an enzyme (e.g., catalase) cleaning the enzymatic bleaching compositions, the compositions and methods of the present invention represent a complete enzymatic textile processing solutions, said solution allows the manufacture of textiles Suppliers for textile products produced with a range of different colors and dressing using only a limited number of enzyme systems. 在另一个方面，提供了用于开展所述方法的组件试剂盒。  In another aspect, there is provided a method for governing the assembly kit. 此类试剂盒例如包括（i)单浴磨蚀和颜色修饰试剂盒，包含纤维素酶和过水解酶系统，(ϋ)颜色修饰试剂盒，包含过水解酶系统和漆酶系统，（iii)磨蚀和颜色修饰试剂盒，包含纤维素酶、过水解酶系统和漆酶系统，或（iv)完整的酶促纺织加工系统，其还可以包含退浆酶、过氧化氢酶、果胶裂解酶或本文中所列或本领域已知的用于纺织加工中的其他酶。 Such kits comprise, for example, (i) one-bath abrasion and color modifying kit comprising a perhydrolase enzyme and a cellulase system, (ϋ) modifying the color kit comprising a perhydrolase enzyme system and laccase systems, (iii) Abrasion and color modifying kit comprising a cellulase, perhydrolase enzyme system and laccase systems, or (iv) complete enzymatic textile processing system, which may further comprise desizing enzymes, catalase, pectate lyase or set forth herein or known in the art for the textile processing of other enzymes. 将理解可以在该试剂盒中包括每个类型的一种或多种酶。 It will be understood each type may include one or more enzymes in the kit. 的底物和过氧化氢源。 The substrate and source of hydrogen peroxide. 漆酶系统可以以适用于纺织品颜色修饰的量和比率包括漆酶和介质。 Laccase system may modify the color of the textile adapted to include amounts and ratios of medium and laccase. 得该说明书的网址的形式提供。 Forms have provided the URL specification. 技术人员显而易见。 Obvious to those skilled. 以下实施例意图进一步说明，但不限制所述组合物和方法。 The following examples are intended to further illustrate, but not limit the compositions and methods. •在50°C 以10 ： I 液比用O. 5g/l (15g) OPTISIZE® 160 淀粉酶（Genencor)和O. 5g/l (15g)非离子表面活性剂（ULTRAVON® Rff(Huntsman))退浆15分钟。  • at 50 ° C and 10: I was compared with O. 5g / l (15g) OPTISIZE® 160 amylase (Genencor) and O. 5g / l (15g) nonionic surfactant (ULTRAVON® Rff ( Huntsman)) desizing 15 minutes. •以30 : I液比持续5分钟的2个冷淋洗步骤。  • to 30: I ratio was 2 for 5 minutes cold rinsing step. •在55V 以10 : I 液比用Ikg 浮石、pH 6. 5-7 (lg/1 磷酸氢二钠2H20+0. 53g/l 柠檬酸H2O)和O. 025g/l的MEX-500中性纤维素酶(Meiji Corp. , Nagoya,日本)石磨洗60分钟。  • at 55V in 10: I ratio was used Ikg pumice, pH 6. 5-7 (. Lg / 1 sodium hydrogen phosphate 2H20 + 0 53g / l citric acid, H2O) and O. 025g / l of MEX- 500 neutral cellulases (Meiji Corp., Nagoya, Japan) stonewashing 60 minutes. · 2个冷淋洗步骤，各自5分钟。  2-cold rinsing steps, each for 5 minutes. 粗斜纹棉布在家用干燥机中干燥并且随后用于制得样品（7x7cm)。  denim was dried in a household dryer and subsequently used to prepare sample (7x7cm). · 450ml不锈钢反应容器充以IOOml的pH 8磷酸盐缓冲液（8. 9g/l磷酸氢二钠2H20+0. 4g/l无水磷酸二氢钠）。  · 450ml stainless steel reaction vessel was charged with pH IOOml 8 phosphate buffer (8. 9g / l disodium hydrogen phosphate 2H20 + 0. 4g / l sodium dihydrogen phosphate anhydrous). ·对每个容器添加5份（7x7cm)石磨洗的IOg重量的粗斜纹棉布样品。  - Add 5 parts (7x7cm) stonewashing of denim cotton IOg weight for each sample container. ·添加6ml/l 的H2O2 溶液(30% wt)和2ml/l 的PGDA( > 99. 7% ) „  - Add 6ml / l solution of H2O2 (30% wt) and 2ml / l of PGDA (> 99. 7%) "
 ·以O. 01,0. 05,0. 3、I. 0,3. O 或10ml/l 的浓度添加过水解酶。  In · O. 01,0. 05,0. 3, I. 0,3. O or concentration of 10ml / l was added perhydrolase. ·将反应容器封闭并载入预加热至60°C的Launder-Oneter中。  - The reaction vessel was closed and heated to a pre-loading of 60 ° C in the Launder-Oneter. •孵育进行60分钟，此后样品通过溢流淋洗，在AEG IPX4离心机中甩干，并用ElnaPress电子熨斗（Electronic iron)按照棉程序干燥并且评价。  • incubation for 60 minutes, after which the sample through the overflow rinsed in AEG IPX4 the spinning centrifuge, and dried and evaluated according to the procedures ElnaPress electron cotton iron (Electronic iron). 这些结果表明过水解酶系统可以在一系列酶浓度范围内对染色的纺织品产生色光修饰。  These results show that the perhydrolase system can produce colored textile dyeing modifications within a range of enzyme concentrations. ·添加I. Oml/1 过水解酶（PRTIVf TVIV® Ecoffhite I (321U/g))。  - Add I. Oml / 1 perhydrolase (PRTIVf TVIV® Ecoffhite I (321U / g)). ·将反应容器封闭并载入预加热至60°C的Launder-O-Meter中。  - The reaction vessel was closed and heated to a pre-loading of 60 ° C in the Launder-O-Meter. 这些结果表明过水解酶系统可以在一系列过氧化氢浓度和PGDA浓度范围内对染色的纺织品产生色光修饰（cast modification)。  These results show that the perhydrolase system may generate colored modified (cast modification) for dyeing textiles in a concentration range of the hydrogen peroxide concentration ranges and PGDA. 重大约3kg的12条粗斜纹棉布裤腿（ACG粗斜纹棉布式样80270)如实施例I中所述那样退浆和石磨洗。 Denim legs 12  weighs approximately 3kg of (ACG denim Shape 80270) as described in Example I above in the desizing and stonewashing embodiment. 在石磨洗后，实验在Launder-O-meter (Hl2型快速实验室染色机）中根据以下方法进行。 In stone washed, the following experiments were performed according to the method of Launder-O-meter (Hl2 Fast laboratory dyeing machine) in. ·添加6ml/l 的H2O2 溶液(30% wt)和O. 2ml/l 的PGDA( > 99. 7% ) „  - Add 6ml / l solution of H2O2 (30% wt) and O. 2ml / l of PGDA (> 99. 7%) "
 ·添加I. Og/Ι 过水解酶（PRIMAGREEN® Ecoffhite I (321U/g))。  - Add I. Og / Ι perhydrolase (PRIMAGREEN® Ecoffhite I (321U / g)). •孵育进行10、20、30、40、50或60分钟，此后样品通过溢流淋洗，在AEG IPX4离心机中甩干，用Elna Press电子熨斗（Electronic iron)按照棉程序干燥并且评价。  • incubating for 10, 20 or 60 minutes, after which the sample was rinsed through the overflow, the AEG IPX4 the spinning centrifuge, Elna Press electron Iron (Electronic iron) and dried following the procedure of cotton Evaluation. [0281 ] 这些结果表明过水解酶系统可以以时间依赖性方式对染色的纺织品产生色光修饰。  These results show that the perhydrolase system may generate a time-dependent manner modified colored textile dyeing. · 450ml不锈钢反应容器充以IOOml的pH 8磷酸盐缓冲液（8. 9g/l磷酸氢二钠2H20+0. 4g/l无水磷酸二氢钠）。  · 450ml stainless steel reaction vessel was charged with pH IOOml 8 phosphate buffer (8. 9g / l disodium hydrogen phosphate 2H20 + 0. 4g / l sodium dihydrogen phosphate anhydrous). ·对每个容器添加5份（7x7cm)石磨洗的IOg重量的粗斜纹棉布样品。  - Add 5 parts (7x7cm) stonewashing of denim cotton IOg weight for each sample container. ·添加I. Oml/1 过水解酶（PRIMAGREEN® Ecoffhite I (321U/g))。  - Add I. Oml / 1 perhydrolase (PRIMAGREEN® Ecoffhite I (321U / g)). ·将反应容器封闭并载入预加热至30、40、50或60°C的Launder-O-Meter中。  - The reaction vessel was closed and heated to 50, or pre-loaded to 60 ° C in the Launder-O-Meter. •孵育进行60分钟，样品通过溢流淋洗，在AEG IPX4离心机中甩干，用Elna Press电子熨斗（Electronic iron)按照棉程序干燥并且评价。  • incubation for 60 minutes, the sample via the overflow rinsed, AEG IPX4 spinning in a centrifuge, with the electronic Elna Press Iron (Electronic iron) drying and evaluated according to the procedure of cotton. 这些结果表明过水解酶系统可以在不同的温度条件下对染色的纺织品产生色光修饰。   These results show that the perhydrolase of the system may create a modified colored textile dyeing under different temperature conditions. •在50°C 以10 ： I 液比用O. 5g/l (15g) OPTISIZE® 160 淀粉酶（Genencor)和0. 5g/l (15g)非离子表面活性剂（ULTRA VON® RW ； Huntsman)退浆15分钟。  • at 50 ° C and 10: I was compared with O. 5g / l (15g) OPTISIZE® 160 amylase (Genencor), and 0. 5g / l (15g) nonionic surfactant (ULTRA VON® RW ; Huntsman) desizing 15 minutes. ·取出4条裤腿作为对照。  - Remove the leg 4 as a control. O. 17g/l柠檬酸）和60°C温度60分钟。 O. 17g / l citric acid) and 60 ° C temperature for 60 minutes. 通过添加4M氢氧化钠溶液维持pH在7。 PH was maintained at 7 by addition of 4M sodium hydroxide solution. •以30 : I液比持续5分钟的2次冷淋洗。  • to 30: I ratio was rinsed twice for 5 minutes in the cold. ·粗斜纹棉布在家用干燥机中干燥。  · denim was dried in a household dryer. 粗斜纹棉布裤腿的漂白在处理后用Minolta色度仪CR 310以具有D65光源的CIELab颜色空间进行评价。  Bleaching of denim legs were evaluated in CIELab color space with D65 light source after treatment using a Minolta Chroma Meter CR 310. 对于每条粗斜纹棉布裤腿，取得8个量值并且平均12条裤腿的结果（96个量值）。 For each denim leg, and the average values ​​to obtain eight results of the legs 12 (96 magnitude). 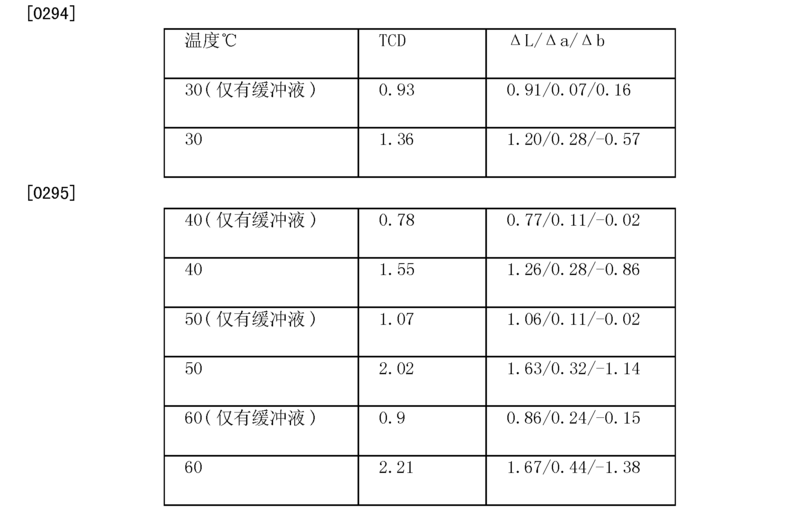 结果在表5中显示。 The results are shown in Table 5. 这些结果表明过水解酶系统可以在依次纤维素酶-过水解酶工艺中在大规模机器中对染色的纺织品产生色光修饰。  These results show that the perhydrolase system can sequentially Cellulase - color light by generating a modified hydrolase in a large scale process textile dyeing machine. O. 5g/l(15g)非离子表面活性剂（ULTRAVON®鼎(Huntsman)退浆15分钟。 O. 5g / l (15g) nonionic surfactant (ULTRAVON® tripod (Huntsman) desizing 15 minutes. 在漆酶处理后和过水解酶处理后，粗斜纹棉布裤腿的漂白用Minolta色度仪CR310以具有D 65光源的CIE Lab颜色空间进行评价。  and after the laccase treatment over enzymatic hydrolysis treatment, bleaching of denim leg using a Minolta Chroma Meter CR310 to CIE Lab color space having a D 65 light source is evaluated. 对于每条粗斜纹棉布裤腿，取得8个量值并且平均12条裤腿的结果（96个量值）。 For each denim leg, and the average values ​​to obtain eight results of the legs 12 (96 magnitude). 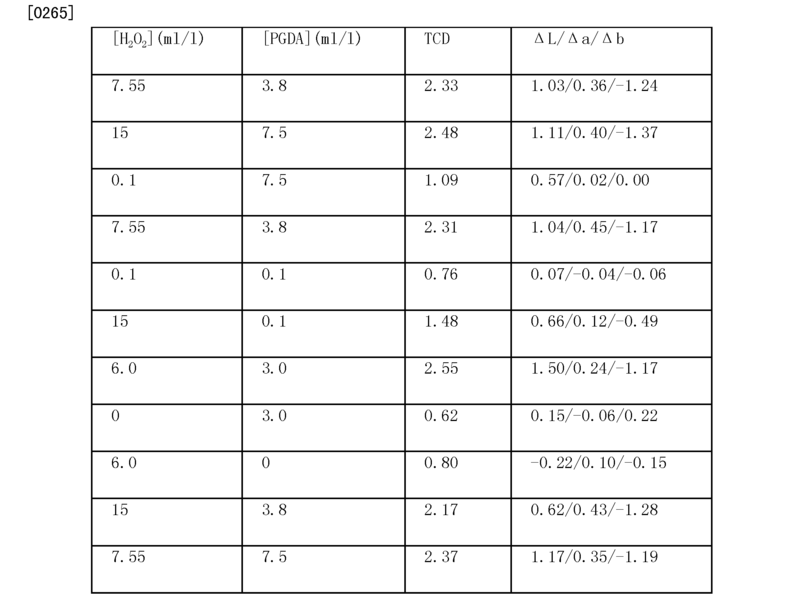 结果在表6中显示。 The results are shown in Table 6. 这些结果表明过水解酶系统可以与漆酶系统组合地使用以产生不同的颜色修饰。  These results show that the perhydrolase system may be used in combination with laccase system be modified to produce different colors. 该实验中使用过水解酶（PRIMAGREEN® Ecoffhite I, 326U/g, I. 5mg 酶蛋白/g)。  The experiment used perhydrolase (PRIMAGREEN® Ecoffhite I, 326U / g, I. 5mg enzyme protein / g). 从Sigma Aldrich 购买H2O2 (30wt%,分析级)和PGDA( > 99. 7% ) „ Purchased from Sigma Aldrich H2O2 (30wt%, analytical grade) and PGDA (> 99. 7%) "
 •在50°C 以10 ： I 液比用O. 5g/l (15g) OPTISIZE® 160 淀粉酶（Genencor)和O. 5g/l (15g)非离子表面活性剂（ULTRA VON® RW(Huntsman)退浆15分钟。  • at 50 ° C and 10: I was compared with O. 5g / l (15g) OPTISIZE® 160 amylase (Genencor) and O. 5g / l (15g) nonionic surfactant (ULTRA VON® RW (Huntsman) desizing 15 minutes. •在55°C以10 : I液比用Ikg浮石、pH 4. 8 (lg/1柠檬酸三钠2H20+0. 87g/l柠檬酸H2O) I. 17g/l 的INDIAGE® 2XL 纤维素酶（Genencor)石磨洗60 分钟。  • at 55 ° C to 10: I ratio was used Ikg pumice, pH 4. 8 (. Lg / 1 trisodium citrate 2H20 + 0 87g / l citric acid H2O) I. 17g / l of INDIAGE® 2XL cellulase (Genencor) stonewashing 60 minutes. ·取出六条裤腿并干燥用于评价。  - six legs removed and dried for evaluation. 石磨洗后，在Unimac UF 50洗涤机中根据以下方法进行过水解酶处理： •以10 : I 液比，用lg/Ι 过水解酶（PRIMAGREEN® EcoWhite l，326U/g，I. 5mg 酶蛋白/g)、6g/l 的H2O2 溶液(30% wt)和3g/l 的PGDA( > 99. 7% )在pH 8(9. Og/I磷酸氢二钠2H20+0. 3g/l无水磷酸二氢钠）和60°C温度60分钟。  stone washed, conducted according to the following method hydrolase Unimac UF 50 in the washing machine:  • at 10: I-liquid ratio, perhydrolase (PRIMAGREEN® EcoWhite l with lg / Ι, 326U / g, I. H2O2 solution 5mg enzyme protein / g), 6g / l of (30% wt) and 3g / l of PGDA (> 99. 7%). Og / I disodium pH 8 (9 hydrogen phosphate 2H20 + 0. 3g / l of anhydrous sodium dihydrogen phosphate) and 60 ° C temperature for 60 minutes. 在漆酶处理后和过水解酶处理后，粗斜纹棉布裤腿的漂白用Minolta色度仪CR310以具有D 65光源的CIE Lab颜色空间进行评价。  and after the laccase treatment over enzymatic hydrolysis treatment, bleaching of denim leg using a Minolta Chroma Meter CR310 to CIE Lab color space having a D 65 light source is evaluated. 对于每条粗斜纹棉布裤腿，取得8个量值并且平均12条裤腿的结果（96个量值）。 For each denim leg, and the average values ​​to obtain eight results of the legs 12 (96 magnitude). 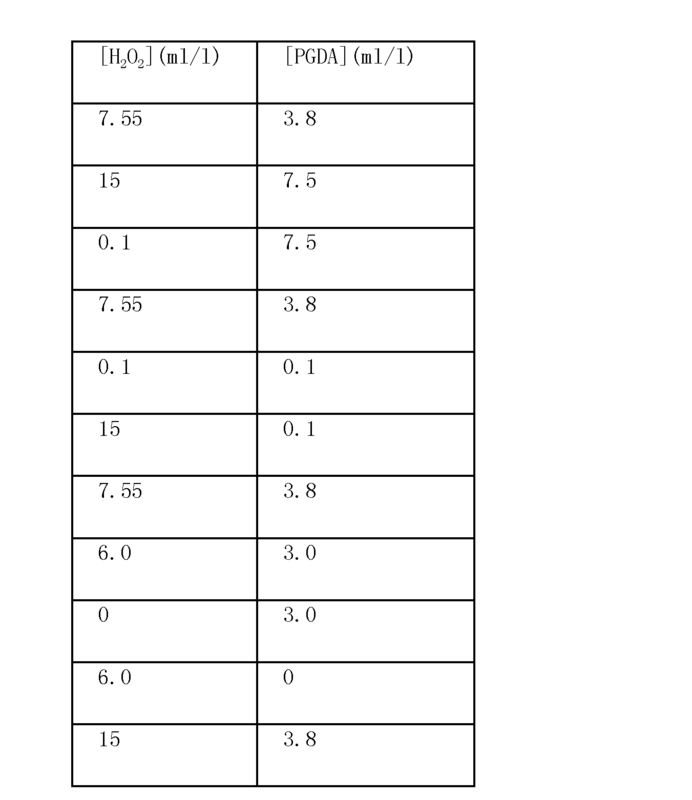 结果在表7中显示。 The results are shown in Table 7. 这些结果表明过水解酶系统可以在依次纤维素酶-过水解酶工艺中对纯靛蓝染色的纺织品产生色光修饰。  These results show that the perhydrolase system can sequentially Cellulase - perhydrolase shade modification process produced pure indigo-dyed textiles. •以10 : I 液比在50°C，pH 6. 5，以O. 4%INDIAGE® Neutra L 纤维素酶（批号40105358001,5, 197NPCNU/g (Genencor)) 40 分钟。  • at 10: I ratio of liquid at 50 ° C, pH 6. 5, to O. 4% INDIAGE® Neutra L cellulase enzymes (batch 40105358001,5, 197NPCNU / g (Genencor)) 40 min. ·石磨洗后，取出I条裤腿并干燥用于评价。  stone-washed, and dried to remove the leg section I for evaluation. •以10 ： I 液比，用lg/Ι 过水解酶（PRIMAGREEN® EcoWhite l，326U/g，I. 5mg 酶蛋白/g)、6g/l 的H2O2 溶液(30% wt)和3g/l 的PGDA( > 99. 7% )在pH 11 (2g/I苏打灰）和50°C温度40分钟。  • at 10: I-liquid ratio, perhydrolase (. PRIMAGREEN® EcoWhite l, 326U / g, I 5mg enzyme protein / g) using lg / Ι, H2O2 was 6g / l of (30% wt) and 3g / l of PGDA (> 99. 7%) at pH 11 (2g / I soda ash) and a temperature of 50 ° C for 40 minutes. ·粗斜纹棉布在工业用干燥机中干燥。  · denim was dried in an industrial dryer. 对粗斜纹棉布裤腿的颜色调节在过水解酶处理后用Minolta色度仪CR 310以具有D 65光源的CIE Lab颜色空间进行评价。  Color on denim legs was adjusted after perhydrolase enzyme treatment was evaluated using a Minolta Chroma Meter CR 310 to CIE Lab color space having a D 65 light source. 对于每条粗斜纹棉布裤腿，取得6个量值并且将结果平均化。 For each denim leg, to obtain six values ​​and the results averaged. 结果在表8中显示。 The results are shown in Table 8. 这些结果表明过水解酶系统可以在依次、单浴纤维素酶-过水解酶工艺中使用。  These results show that the perhydrolase system, one-bath cellulase sequentially - perhydrolase enzyme used in the process. •以10 ： I 液比在50°C，pH 6. 5，以O. I %INDIAGE® Neutra L 纤维素酶（批号40105358001,5，197NPCNU/g (Genencor))石磨洗40 分钟。  • at 10: I ratio of liquid at 50 ° C, pH 6. 5, to O. I% INDIAGE® Neutra L Cellulase (Lot 40105358001,5,197NPCNU / g (Genencor)) stonewashing 40 minutes . · 2个冷淋洗步骤，各自3分钟。  2-cold rinsing steps, each for 3 minutes. •以15 : I 液比，用lg/Ι 过水解酶、6g/l 的H2O2溶液（30% wt)和3g/l 的PGDA(>99. 7% )在pH 11(2. Og/1苏打灰)和50。  • to 15: I-liquid ratio, perhydrolase with lg / Ι, 6g / l of H2O2 solution (30% wt) and 3g / l of PGDA (> 99 7%.) At pH 11 (2 Og. / 1 soda ash) and 50. 。 . 温度40分钟。 Temperature for 40 minutes. · 2次冷淋洗3分钟。  · 2 cold rinse for 3 minutes. ·取出I条裤腿用于评价并在工业用干燥机中干燥。  - Remove the leg for evaluating the I bar and dried in an industrial dryer. I. 5mg 酶蛋白/g)、6g/l 的H2O2 溶液(30% wt)和3g/l 的PGDA( > 99. 7% )在pH 11(2. Og/I苏打灰）和50°C温度40分钟。 H2O2 solution I. 5mg enzyme protein / g), 6g / l of (30% wt) and 3g / l of PGDA (> 99. 7%) at pH 11 (2. Og / I soda ash) and a temperature of 50 ° C 40 minutes. 在漆酶处理后和过水解酶处理后，粗斜纹棉布裤腿的漂白和颜色调节用Minolta色度仪CR 310以具有D 65光源的CIE Lab颜色空间进行评价。  and after the laccase treatment over enzymatic hydrolysis treatment, bleaching of denim leg adjustment and color was evaluated using a Minolta Chroma Meter CR 310 to CIE Lab color space having a D 65 light source. 对于每条粗斜纹棉布裤腿，取得6个量值并且将结果平均化。 For each denim leg, to obtain six values ​​and the results averaged. 结果在表9中显示。 The results are shown in Table 9. 这些结果表明过水解酶系统可以用在与纤维素酶和漆酶系统的不同组合中，以产生独特的修整效果。  These results show that the perhydrolase system may be used in different combinations of cellulase and laccase systems, trimmed to produce a unique effect. 该实验中使用过水解酶（PRIMAGREEN® Ecoffhite 1，326U/g，I. 5mg 酶蛋白/g)。  The experiment used perhydrolase (PRIMAGREEN® Ecoffhite 1,326U / g, I. 5mg enzyme protein / g). 从Sigma Aldrich 购买H2O2 (30wt%,分析级)> PGDA( > 99. 7% ) „ H2O2 purchased from Sigma Aldrich (30wt%, analytical grade)> PGDA (> 99. 7%) "
[0401 ] · 2个冷淋洗步骤，各自5分钟。  2-cold rinsing steps, each for 5 minutes. ·取出服装并干燥用于评价。  * removed clothing and dried for evaluation. I. 5mg 酶蛋白/g)、6g/l 的H2O2 溶液(30% wt)和3g/l 的PGDA ( > 99. 7% )在2g/l 碳酸钠(pH 11)和50。 I. 5mg enzyme protein / g), H2O2 was 6g / l of (30% wt) and 3g / l of PGDA (> 99. 7%) in 2g / l sodium carbonate (pH 11) and 50. 。 . 温度60分钟。 Temperature for 60 minutes. ·服装在家用干燥机中干燥。 -drying clothing in a home dryer. 在过水解酶处理后，粗斜纹棉布裤腿的漂白用Minolta色度仪CR310以具有D 65光源的CIE Lab颜色空间进行评价。  After the perhydrolase enzyme treatment, bleaching of denim leg using a Minolta Chroma Meter CR310 to CIE Lab color space having a D 65 light source is evaluated. 对于每件服装，取得16个量值。 For each piece of clothing, made 16 value. 结果在表10中显示。 The results are shown in Table 10. 这些结果表明过水解酶系统可以对硫化染料染色的卡其服装产生颜色调整。  These results show that the perhydrolase of the system may generate color adjustment sulfur dyed khaki clothing. •在600C 以15 : I 液比用O. 4g/l OPTISIZE® 160 淀粉酶(Genencor)和O. 5g/I非离子表面活性剂（ULTRA VON® RW ； Huntsman)退浆15分钟。  • at 600C to 15: I ratio was used O. 4g / l OPTISIZE® 160 amylase (Genencor) and O. 5g / I nonionic surfactant (ULTRA VON® RW; Huntsman) desizing 15 minutes. •以30 : I液比持续2分钟的2个冷淋洗步骤。  • to 30: I ratio was 2 for 2 minutes cold rinsing step. 0. 5g/l PRIMAFAST® 200 纤维素酶30 分钟。 0. 5g / l PRIMAFAST® 200 Cellulase 30 minutes. ·石磨洗后，取出4条裤腿（2条硫化染料染色的100%棉质裤腿和2条硫化染料染色的65%棉/35%聚酯裤腿）并干燥用于评价。  stone-washed, extracted four legs (two legs 100% cotton sulfur dyes and sulfur dyes two 65% cotton / 35% polyester leg) and dried for evaluation. 1. 5mg 酶蛋白/g)、6g/l 的H2O2 溶液(30% wt)和3g/l 的PGDA( > 99. 7% )在pH 7. 6(12g/I的95%二水合磷酸氢二钠+5%无水磷酸二氢钠的掺合物）和60°C温度60分钟。 H2O2 solution 1. 5mg enzyme protein / g), 6g / l of (30% wt) and 3g / l of PGDA (> 99. 7%) at pH 7. 6 (12g / I 95% dipotassium hydrogen phosphate dihydrate Na + 5% sodium dihydrogen phosphate anhydrous blend) and 60 ° C temperature for 60 minutes. · 2次冷淋洗2分钟。  1.2 times cold rinsed for 2 minutes. 在过水解酶处理后，对硫化染料染色裤腿的颜色调节用Minolta色度仪CR 310以具有D 65光源的CIE Lab颜色空间进行评价。  After the perhydrolase enzyme treatment, the color of the legs adjustment sulfur dyes was evaluated using a Minolta Chroma Meter CR 310 to CIE Lab color space having a D 65 light source. 对于每条粗斜纹棉布裤腿，取得4个量值并且将结果平均。 For each denim leg, to obtain four values, and the results were averaged. 结果在表11中显示。 The results are shown in Table 11. 这些结果表明在单浴纤维素酶-过水解酶工艺中与酸性纤维素酶组合使用时，过水解酶系统可以对硫化染料染色的100%棉质材和棉花掺合材料产生颜色修饰。  These results indicate that one-bath Cellulase - when using an acidic cellulase enzyme in combination with the perhydrolase process, the perhydrolase enzyme system may produce a color modification of sulfur dyes is 100% cotton and cotton blended material sheet . •在600C 以15 : I 液比用O. 4g/l OPTISIZE® 160 淀粉酶(Genencor)和O. 5g/I非离子表面活性剂（ULTRAVON® RW ；Huntsman)退浆15分钟。  • at 600C to 15: I ratio was used O. 4g / l OPTISIZE® 160 amylase (Genencor) and O. 5g / I nonionic surfactant (ULTRAVON® RW; Huntsman) desizing 15 minutes. •以15 : I 液比在50°C，pH 7· 3 (以65ml 5% 乙酸溶液设定），0· lg/1 STCE 纤维素酶(Meiji Corp. , Nagoya,日本）30 分钟。  • to 15: I ratio of liquid at 50 ° C, pH 7 · 3 (in a 65ml 5% acetic acid solution is set), 0 · lg / 1 STCE cellulase (Meiji Corp., Nagoya, Japan) for 30 minutes . I. 5mg 酶蛋白/g)、6g/l 的H2O2 溶液(30% wt)和3g/l 的PGDA( > 99. 7% )在pH 7. 6(12g/I的95%二水合磷酸氢二钠+5%无水磷酸二氢钠的掺合物）和60°C温度60分钟。 H2O2 solution I. 5mg enzyme protein / g), 6g / l of (30% wt) and 3g / l of PGDA (> 99. 7%) at pH 7. 6 (12g / I 95% dipotassium hydrogen phosphate dihydrate Na + 5% sodium dihydrogen phosphate anhydrous blend) and 60 ° C temperature for 60 minutes. •粗斜纹棉布在工业用干燥机中干燥。  • denim was dried in an industrial dryer. 在过水解酶处理后，对硫化染料染色裤腿的颜色调节用Minolta色度仪CR 310以具有D 65光源的CIE Lab颜色空间进行评价。  After the perhydrolase enzyme treatment, the color of the legs adjustment sulfur dyes was evaluated using a Minolta Chroma Meter CR 310 to CIE Lab color space having a D 65 light source. 对于每条粗斜纹棉布裤腿，取得4个量值并且将结果平均。 For each denim leg, to obtain four values, and the results were averaged. 结果在表12中显示。 The results are shown in Table 12. 这些结果表明在单浴纤维素酶-过水解酶工艺中与中性纤维素酶组合使用时，过水解酶系统可以对硫化染料染色的100%棉质材和棉掺合材料产生颜色修饰。  These results indicate that one-bath Cellulase - when used with a neutral cellulase enzyme composition perhydrolase process, the perhydrolase enzyme system may produce a color on the 100% cotton and cotton blended material sheet of sulfur dyes modification. 尽管已经通过旨在明晰理解的说明和例举方式某种程度详细地描述了前述发明，不过本领域技术人员显而易见可以实施某些变化和修改而不脱离本发明的精神和范围。  Although description has been intended to clear understanding and exemplified the manner described with a certain degree invention in detail, but the present embodiment may be apparent to persons skilled in the art that certain changes and modifications without departing from the spirit and scope of the invention. 因此，所述描述不应当解释为限制本发明的范围。 Accordingly, the description should not be construed as limiting the scope of the invention. 本文中提到的全部出版物、专利及专利申请通过引用的方式完整地并入用于全部目的和至相同程度，如同专门且个别地说明通过引用方式如此并入每份单独的出版物、专利或专利申请。  All publications mentioned herein, patents and patent applications incorporated by reference in their entirety and for all purposes to the same extent as if specifically and individually indicated to be incorporated by reference each such individual publication , patent or patent application. 1.用于磨蚀染色纺织品和修饰染色纺织品颜色的酶促方法，包括： (a)使纺织品与纤维素酶接触以磨蚀该纺织品；和(a)使纺织品与过水解酶系统接触以修饰该纺织品的颜色； 其中（a)和（b)在单浴液中进行。 A method for the enzymatic abrasion dyeing textiles and textile dyeing color modification, comprising: (a) contacting a textile with cellulase abrasion to the textile; and (a) a textile contacting the perhydrolase enzyme system to modify the textile color; wherein (a) and (b) in a single bath. 2.前述权利要求任一项所述的方法，其中（a)和（b)依次或同时进行。 2. The method according to any one of the preceding claims, wherein (a) and (b) sequentially or simultaneously. 3.前述权利要求任一项所述的方法，其中在（a)之前是酶促退浆步骤。 3. The method according to any one of the preceding claims, wherein prior to (a) is an enzymatic desizing step. 4.权利要求3所述的方法，其中酶促退浆步骤在与（a)和（b)相同的浴液中进行。 4. The method of claim 3, wherein the enzymatic desizing step is carried out in the same bath (a) and (b),. 5.前述权利要求任一项所述的方法，其中在（b)后是过氧化氢酶的添加。 The method according to any one of the preceding claims, wherein (b) is added after the catalase. 6.权利要求5所述的方法，其中将过氧化氢酶添加至其中进行（a)和（b)的相同浴液中。 6. The method of claim 5, wherein the catalase is added to the same bath, and wherein (b) in (a). 7.用于磨蚀染色纺织品和修饰染色纺织品颜色的酶促方法，包括： (a)使纺织品与包含纤维素酶的组合物接触以磨蚀该纺织品；和(b)使纺织品与漆酶系统接触以进行该纺织品的第一颜色修饰；和(C)使纺织品与过水解酶系统接触以进行该纺织品的第二颜色修饰； 其中通过（b)和（C)组合所产生的总体颜色修饰不同于（b)中的第一颜色修饰和（C)中的第二颜色修饰。 7. A method for enzymatic modification of abrasion dyeing textiles and textile dyeing color, comprising: (a) a textile with a composition comprising a cellulase abrasion contacting the textile; and (b) a textile contacting laccase system performing a first modification of the color of the textile; and (C) a textile perhydrolase enzyme system and contacted to a second modification of the color of the textile; wherein the overall color by (b) and (C) is different from the composition resulting modified ( b) modifying the first color and (C) a second color modification. 8.权利要求7所述的方法，其中（b)在（c)之前进行。 The method of claim 7, wherein (b) is performed before (c). 9.权利要求8所述的方法，其中（a)和（b)在单浴液中依次或同时进行。 9. The method as claimed in claim 8, wherein (a) and (b) simultaneously or sequentially in a single bath. 10.权利要求7所述的方法，其中（c)在（b)之前进行。 10. The method of claim 7, wherein (c) is performed before (b). 11.权利要求10所述的方法，其中（a)和（C)在单浴液中依次或同时进行。 11. The method of claim 10, wherein (a) and (C) sequentially or simultaneously in a single bath. 12.权利要求10或11所述的方法，其中在（b)后： (d)使纺织品与过水解酶系统接触以进行染色纺织品的第三颜色修饰。 12. A method according to claim 10 or claim 11, wherein after (b): (d) contacting a textile with a perhydrolase enzyme system for modification of the third color dyed textiles. 13.权利要求7-12任一项所述的方法，其中在（a)之前是酶促退浆步骤。 13. A method according to any one of claims 7-12, wherein in (a) prior to an enzymatic desizing step. 14.权利要求13所述的方法，其中酶促退浆步骤在与（a)相同的浴液中进行。 14. The method of claim 13, wherein the enzymatic desizing step with (a) the same bath. 15.权利要求7-14任一项所述的方法，其中在（c)后添加过氧化氢酶。 15. The method of any one of claims 7-14, wherein in (c) after addition of catalase. 16.权利要求7-15任一项所述的方法，其中将过氧化氢酶添加至其中进行（a)、(b)和/或（C)任意者的相同浴液中。 16. A method according to any one of claims 7-15, wherein the catalase is added thereto for (A), the same bath (b) and / or (C) of any of those. 17.前述权利要求任一项所述的方法，其中纤维素酶选自酸性纤维素酶、中性纤维素酶和碱性纤维素酶。 17. The method of any one of the preceding claims, wherein the acid cellulase enzyme is selected from cellulase, alkaline neutral cellulases and cellulases. 18.前述权利要求任一项所述的方法，其中过水解酶系统包含过水解酶和酯底物，其中过水解酶以等于或大于I的过水解：水解比率催化酯底物的过水解。 18. The method according to preceding claim any one of claims, wherein the perhydrolase enzyme system comprising a perhydrolase enzyme and the ester substrate, wherein the perhydrolase enzyme is greater than or equal to I perhydrolysis: hydrolysis ratio catalyze perhydrolysis of an ester substrate. 19.前述权利要求任一项所述的方法，其中过水解酶系统包含耻垢分枝杆菌(Mycobacterium smegmatis)过水解酶或其变体。 19. The method of any one of the preceding claims, wherein the perhydrolase enzyme system comprising a Mycobacterium smegmatis (Mycobacterium smegmatis) or a variant perhydrolase. 20.前述权利要求任一项所述的方法，其中过水解酶是耻垢分枝杆菌过水解酶的S54V变体或其变体。 20. The method according to preceding claim any one of claims, wherein the perhydrolase is M. smegmatis perhydrolase S54V variant or a variant thereof. 21.前述权利要求任一项所述的方法，其中漆酶是单色下皮黑孔菌（Cerrenaunicolor)漆酶或其变体。 21. A method according to any one of the preceding claims, wherein the laccase is a monochrome black skin volvatus (Cerrenaunicolor) laccase or a variant thereof. 22.前述权利要求任一项所述的方法，其中纺织品是粗斜纹棉布。 22. The method according to any one of the preceding claims, wherein the textile is denim. 23.前述权利要求任一项所述的方法，其中染料是靛蓝染料。 23. The method according to any one of the preceding claims, wherein the dye is indigo. 24.前述权利要求任一项所述的方法，其中染料是硫化染料。 24. The method according to any one of the preceding claims, wherein the sulfur dye is a dye. 25.通过前述权利要求任一项所述方法产生的纺织品。 25. By the textile according to any preceding claim produced by a method. 26.权利要求25所述的纺织品，其中纺织品是靛蓝染色的粗斜纹棉布。 26. A textile according to claim 25, wherein the textile is indigo dyed denim. 27.权利要求25所述的纺织品，其中纺织品是硫化染料染色的粗斜纹棉布。 27. The textile recited in claim 25, wherein the textile is dyed denim sulfur dye. MX348697B (en) * 2010-12-30 2017-06-26 Novozymes As Processes for treating textile with polypeptide having cellulolytic enzyme enhancing activity. MX2014003033A (en) 2011-09-23 2014-05-28 Novozymes As Color modification of textile. ES2230594T3 (en) 2005-05-01 Process for removal or bleaching of soiling or stains from cellulosic fabric.